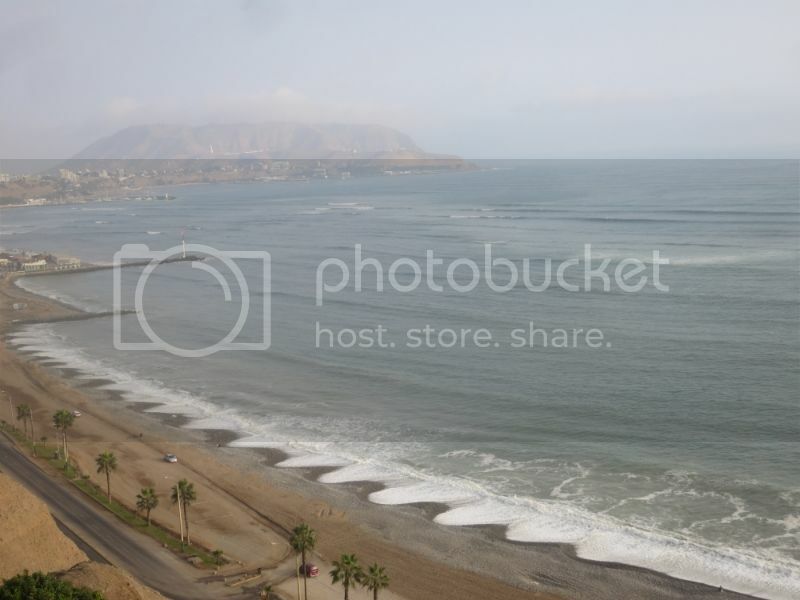 Lima is a beautiful city on the coast of Peru. Though it lies on a subtropical desert and it rarely rains, the city is remarkably colorful. During my visit I stayed in the Miraflores neighborhood which I enjoyed quite a bit. 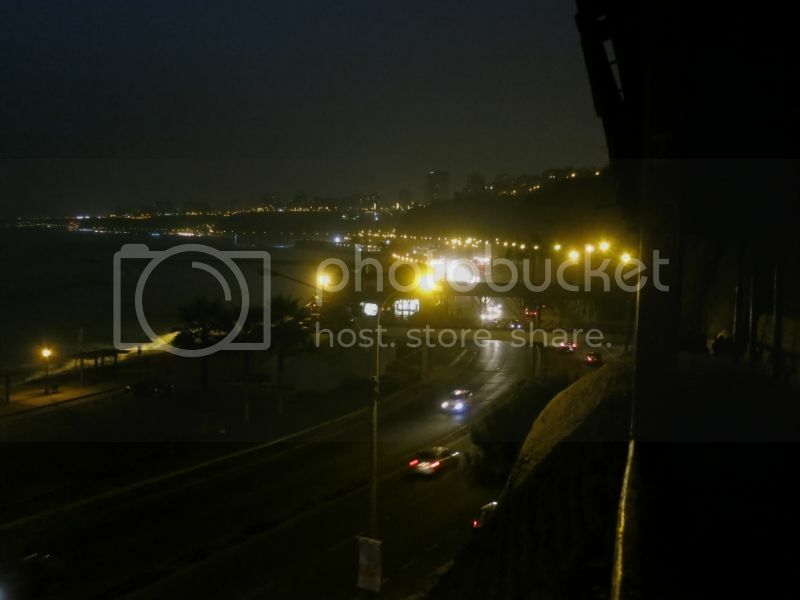 There were plenty of good food options within a 15 minute walk of my hotel, and each night we enjoyed a leisurely stroll down the Malecon which is a walkway on a cliff overlooking the Pacific Ocean. 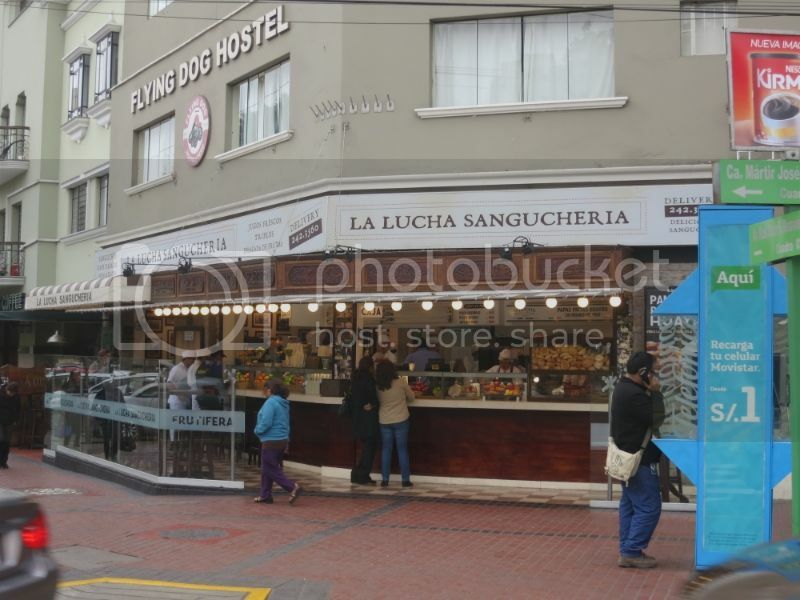 Perhaps the best thing about staying in Miraflores, though, were the snack shops. Pasteleria San Antonio is a famous chain of bakeries with 5 outposts spread across the city. 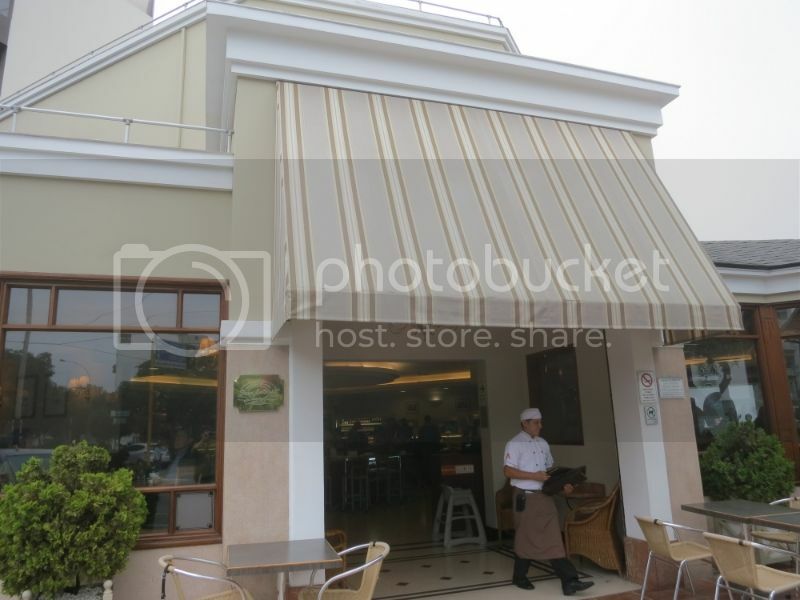 The one in Miraflores has a nice outdoor eating area and the largest variety of Peruvian baked goods I saw in Lima. Ordering was a bit challenging because they wanted you to order at the table but the pastries were all laid out in a display case inside. We persevered though and ended up with a nice array of pastries and sandwiches. We were there on a Sunday morning and the place was packed with families enjoying a light breakfast. I can't say I enjoyed Peruvian empanadas all that much since the meat fillings were all sweet in a way that I found unpleasant and the empanadas at San Antonio were no exception. I kept looking for cheese filled empanadas since I figured I would enjoy those more, but I never found them on this trip. I did enjoy the alfajores though. 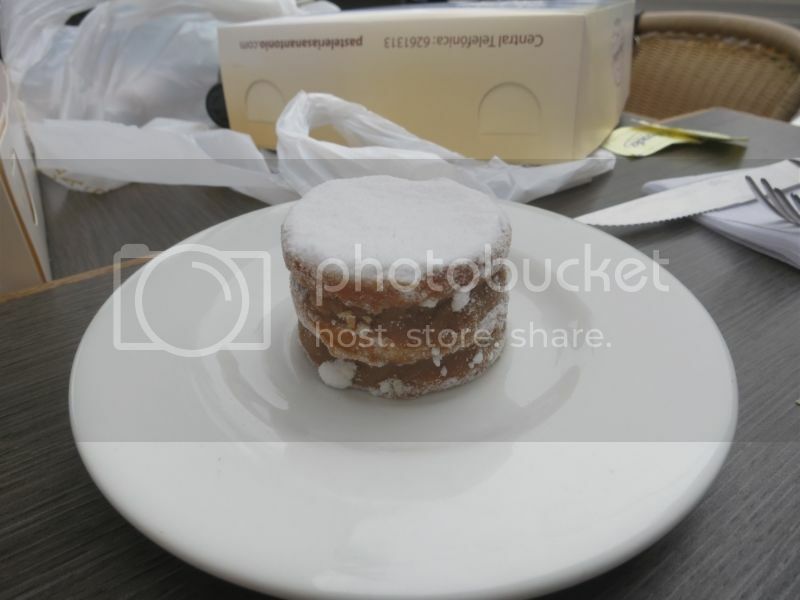 An alfajor is a sandwich cookie that is made with layers of short bread and dulce de leche and topped with powdered sugar. They're easy to find in Lima and San Antonio served my favorite version. 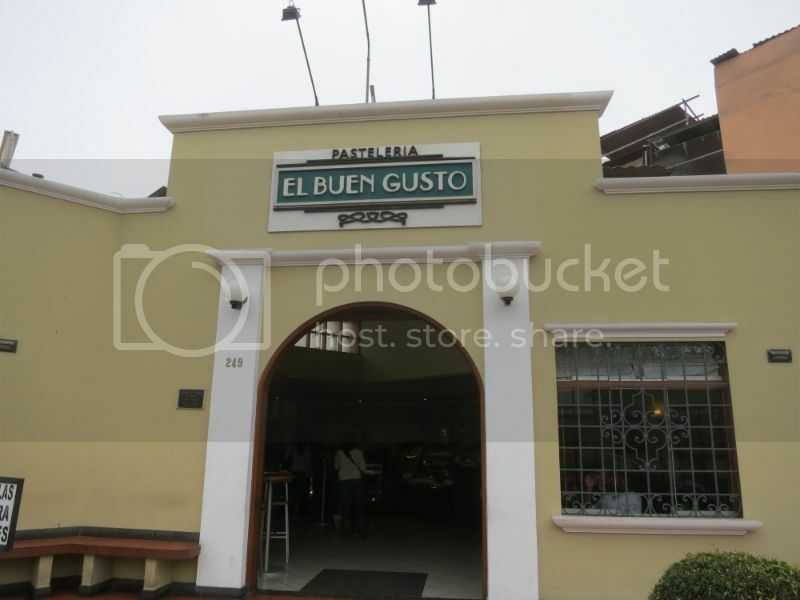 My other favorite bakery was Pasteleria El Buen Gusto. The vibe is pretty different from San Antonio since it's smaller and they don't have any waiters. You walk up to the display case filled with freshly baked pastries, tell them your order, they hand you a ticket, then you pay at the cashier, then take your receipt to the counter to collect your order. 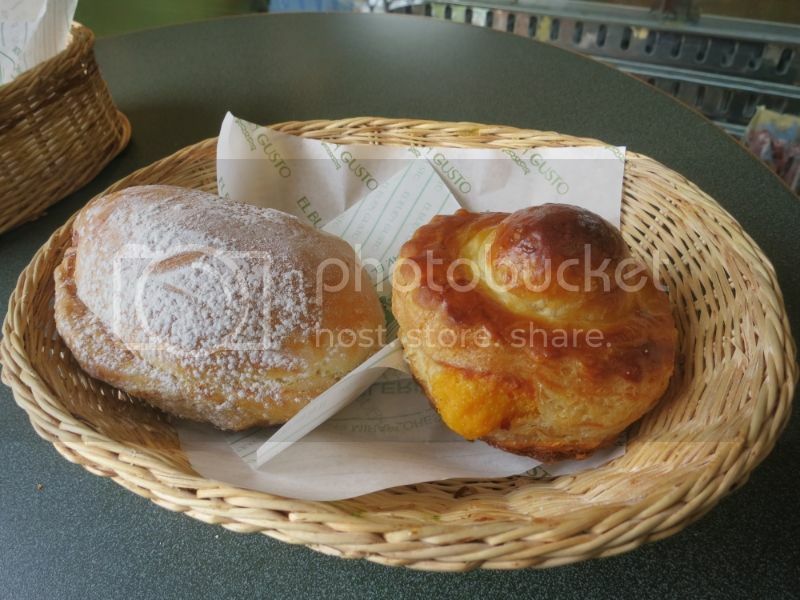 They have a good variety of cookies and such, but my favorite pastry by far was the cheese-filled bun. The crust was buttery and flaky (similar to a croissant) and cheese stuffing was gooey and pretty sharp. They are famous for their empanadas, but I just couldn't enjoy the combination of sugar and ground beef. My favorite snack food in Lima was definitely the churros at Manolo. They have quite a bit of seating and a reasonably large menu, but I never made it past the front area where they are handing out churros. 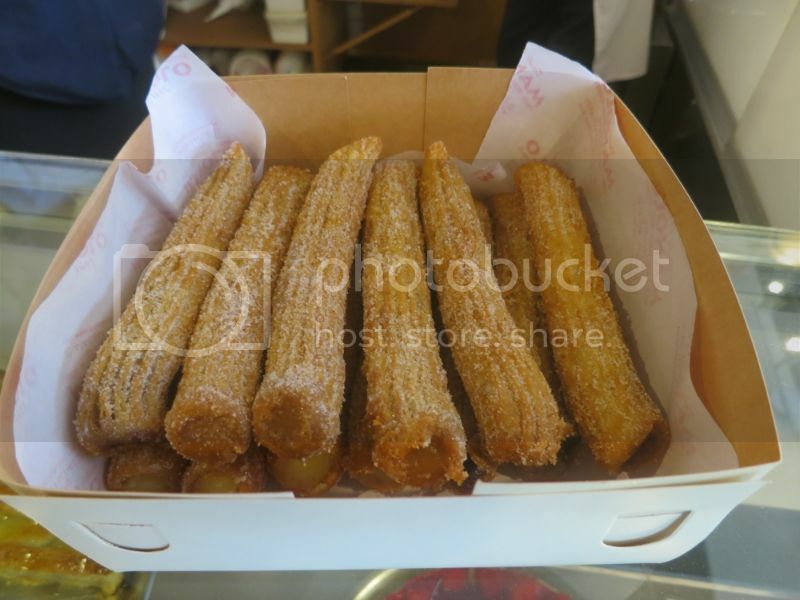 They have chocolate, vanilla, and dulce de leche filled churros as well as smaller plain ones that you're supposed to dip in their hot chocolate. They aren't fried to order though they remain crunchy since they are being churned out constantly. They are covered with powdered sugar that enhances the crunch quite a bit. 4D is famous chain of gelato shops with an outpost at the airport and the locale in Miraflores served as a welcome treat after an hour hiking around the ruins at Huaca Pucllana. 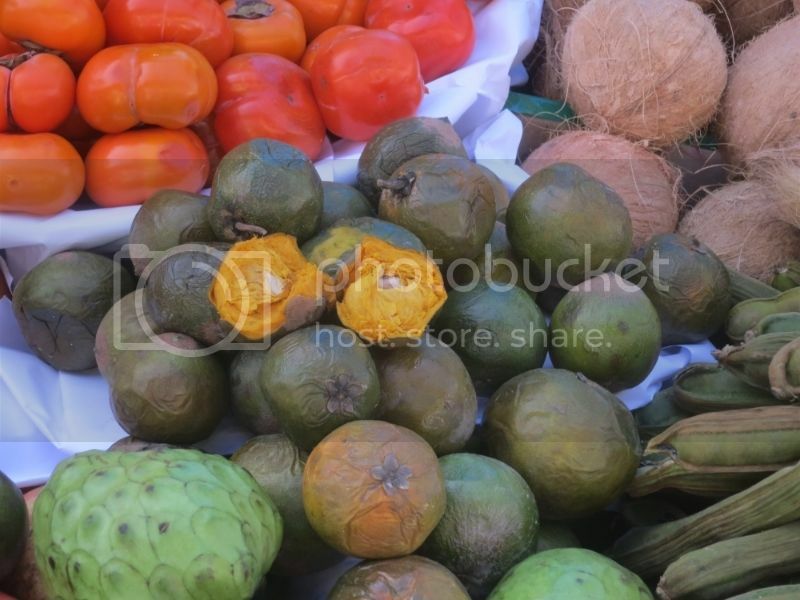 They offer quite a few tropical flavors like cherimoya and passion fruit, but the real stand out was the local favorite, lucuma. Lucuma is a starchy fruit that tastes like butterscotch. 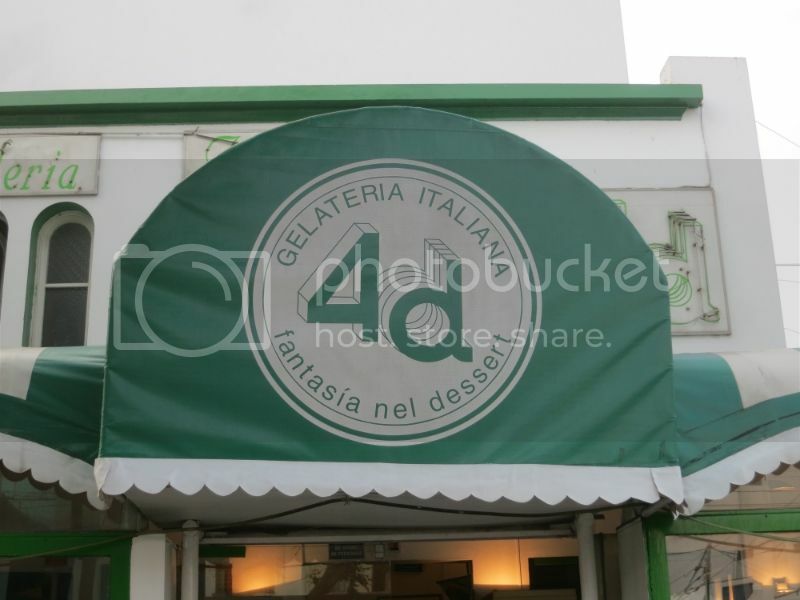 The flavor showed up in a lot of desserts around town and worked incredibly well as a gelato flavor. I could see pairing this with a number of different flavors of gelato to make for some excellent combinations. Definitely something to check out when visiting Lima. Peru doesn't have a robust coffee culture, though it does seem to be evolving. I discovered two coffee shops that specialize in Peruvian beans that they roast locally. Arabica Espresso Bar roasts the beans off site (mostly for distribution across Peru) whereas Cafe Verde actually roasts the beans on the premises. Arabica is run by a woman from Albany, NY who was excited to greet Americans when we walked in the shop. They offer pour overs and a typical array of espresso drinks. Cafe Verde has a more corporate feel and though they offer pour overs (at least they had the equipment in the back) they are almost exclusively selling espresso drinks. Both offer some excellent coffee though I preferred the vibe and the beverages at Arabica. I learned that it is illegal to import green coffee beans to Peru since Peru is a coffee producing country. So if you want freshly roasted beans, there aren't many options. I wouldn't be surprised if more and more Peruvian beans hit the US market, but for now, there are at least two spots in Lima serving up great coffee from locally roasted sources. Ah, thanks very much for this post! Despite living in Chile for many years and visiting other countries in the area, I never had a chance to visit Peru. 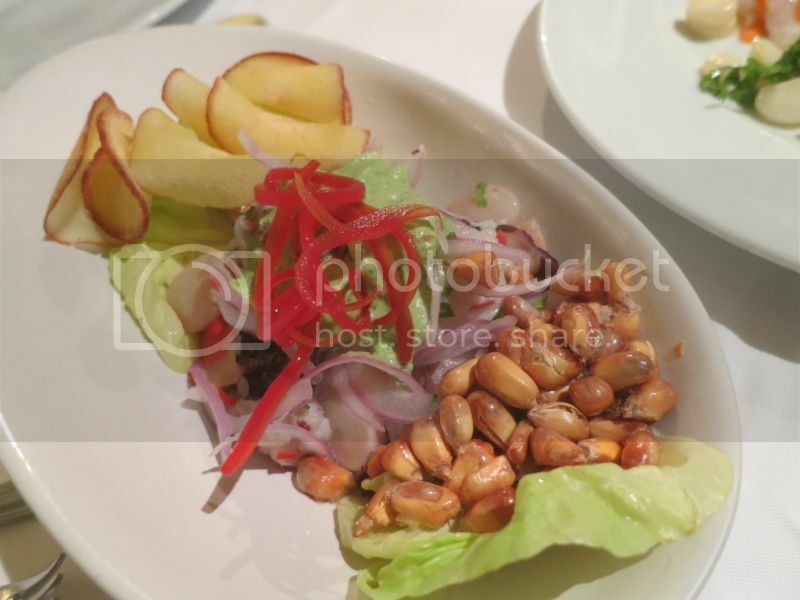 I can tell you, though, that Peruvian cuisine is very popular at the handful of restaurants in Santiago where it is served -- especially the hot seafood dishes and ceviche. I can't remember what Peruvian empanadas are like and how they compare to Chilean empanadas. Lucuma, which is also sold in Chile, is my favorite ice cream flavor, and I miss it dearly. I have seen frozen packaged lucuma pulp at either H-Mart or Mitsuwa Market--that might be the only way for me to recreate lucuma ice cream on my own here in Chicago. Chileans have a great love of sweet pastries (much stronger than mine); it is interesting to see that these are popular in Lima as well. Chile doesn't have much of a coffee culture either (nor does Bolivia, as I recall). They are happy with Nescafe. Interesting that it is so different in Venezuela and Colombia, not so far away. Looking forward to your future posts in this thread. Lucuma looks familiar, but can't remember where I might have had it. Very interested in Peru and glad this thread has started. ya gotta go to la mar.....really, really good. Hopefully we'll see some anticuchos photos from Tia Grima soon. My first, and still best, taste. While the pollo a la brasa at D'Candela here in Chicago was tasty, their anticuchos did not come close to Tia Grima's. Don't go too early though, most coffeeshops don't seem to open before 9 or 10! Sorry it took me so long to follow up. I'll start with the quick sit down lunch spots. Lima has a wealth of interesting lunch options which in many ways outshone the dinners I had. I was particularly impressed by the range and quality of the options. Lucha Sangucheria is a well known sandwich and juice shop that does brisk business all day. I visited the outpost next to Parque Kennedy in Miraflores a couple times and would recommend that location since it offers the widest varieties of sandwiches and juices. The sandwich really is first and foremost about the bread. It is light as a feather with a wonderfully crispy exterior and a spongy, chewy interior. The meats and sauces are all good though nothing stood out as spectacular, but the bread really brought every sandwich together. 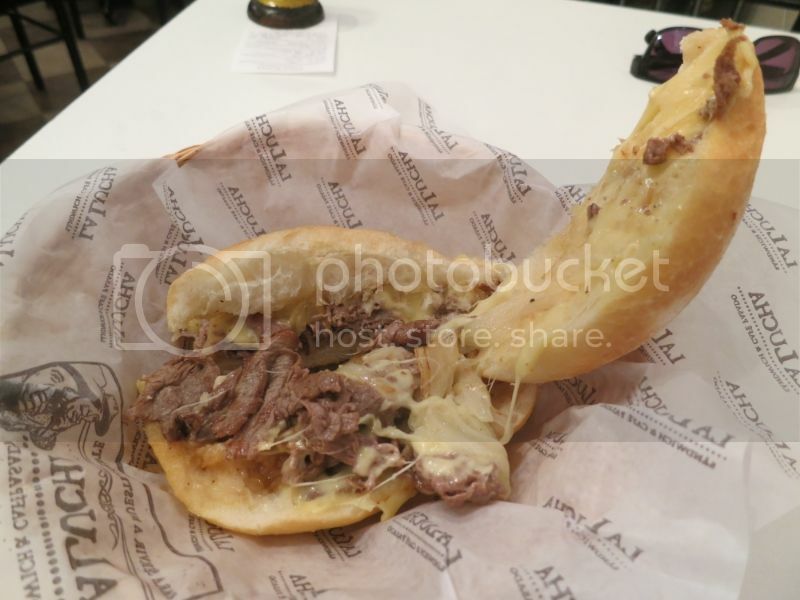 The sandwich that is pictured is "La Lucha" which features a flavorful grilled tenderloin and edam cheese. They also offer ham, chicken, and chicarron as well as a variety of sauces like golf (a mixture of ketchup and mayo) and aji which is a common creamy pepper spread. It's a quick and affordable lunch that's easy to eat on the go. 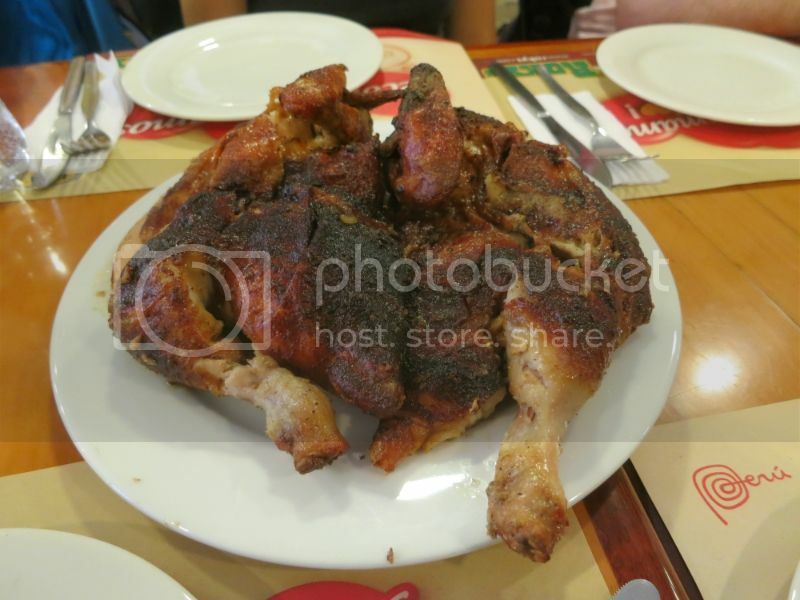 No trip to Lima would be complete without visiting at least one of the famous pollo a la brasa restaurants. There are outposts of Pardo's, Norky's, and Roky's all over the city and I'm sure the debates about which is the best would rival the deep dish wars that rage on in Chicago. 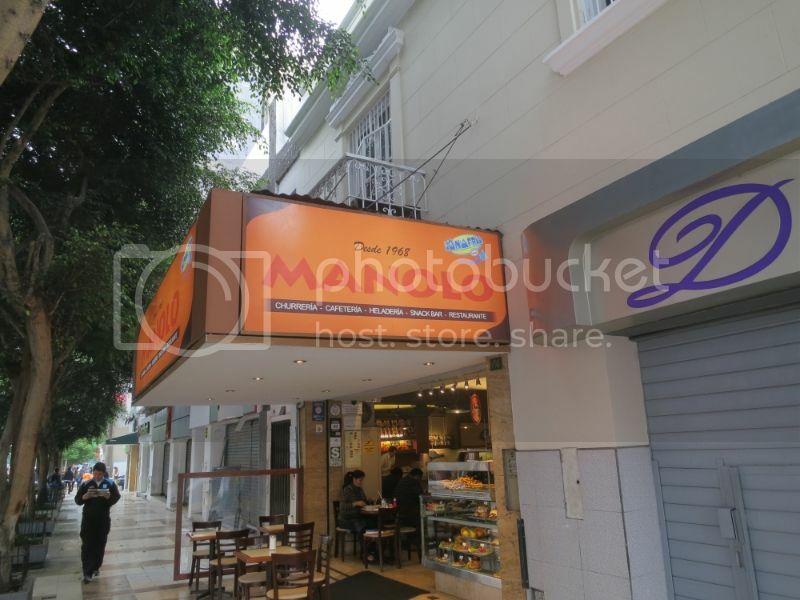 The restaurants are quite large, usually 2 or 3 stories, and are capable of seating huge groups. 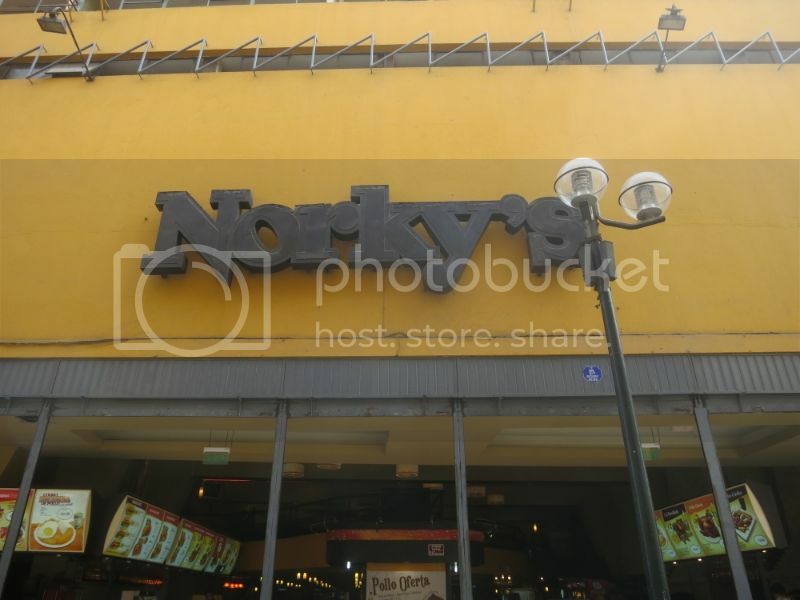 There is a Norky's and Roky's across the street from each other at the end of Jiron de la Union which is a pedestrian street in the Centro Historico. So naturally we tried both. The meal was similar at both restaurants. An entire chicken, lots of spicy aji sauce, and a bottle of Inka Cola. are a well known pairing in Lima. 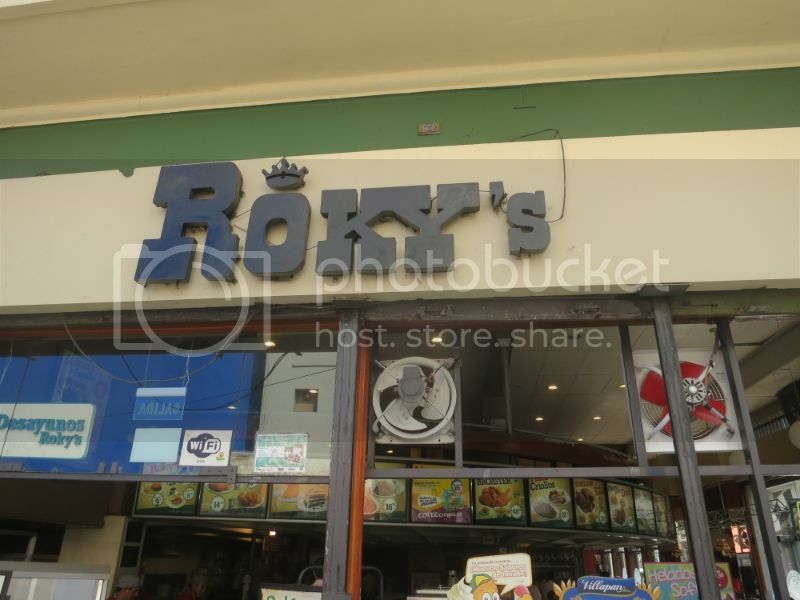 The vibe at Roky's was very similar and it was a little more crowded than Norky's for lunch on Sunday. 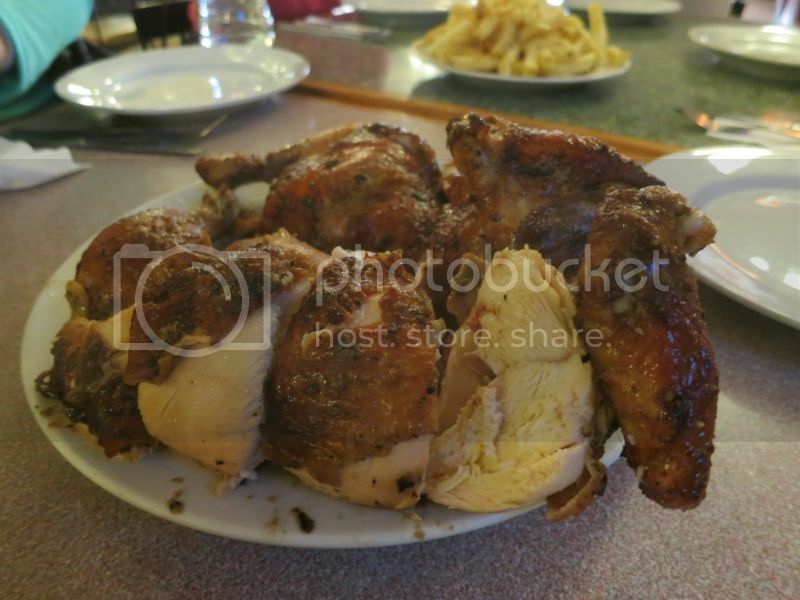 Once again we ordered an entire chicken which comes with a bottle of Inka Cola. We also ordered some chaufa which is Peruvian fried rice. The chaufa was pretty garlicky and tasted just like fast food Chinese fried rice tastes in the US. The chicken, though, was spectacular. Whereas the Norky's chicken emphasized the juiciness of the chicken, Roky's seemed to emphasize the spices and skin more. Though neither had crispy skin, the flavor of the skin at Roky's was much fuller and richer. Also the chicken was a little drier, perhaps a by-product of the more intense flavor on the exterior. The group was split between the two chickens, though my vote was for the more flavorful Roky's chicken. There wasn't as much street food as I was expecting in Lima. This was probably a reflection of the parts of town I spent my time in, but still I would have expected to see more street vendors in general. That being said, there certainly were some good bites to be had from street stalls. The best street food I had on the trip was from the vendors parked in front of Parque de la Reserva during the magic water show that takes place there at night Wednesday through Sunday. 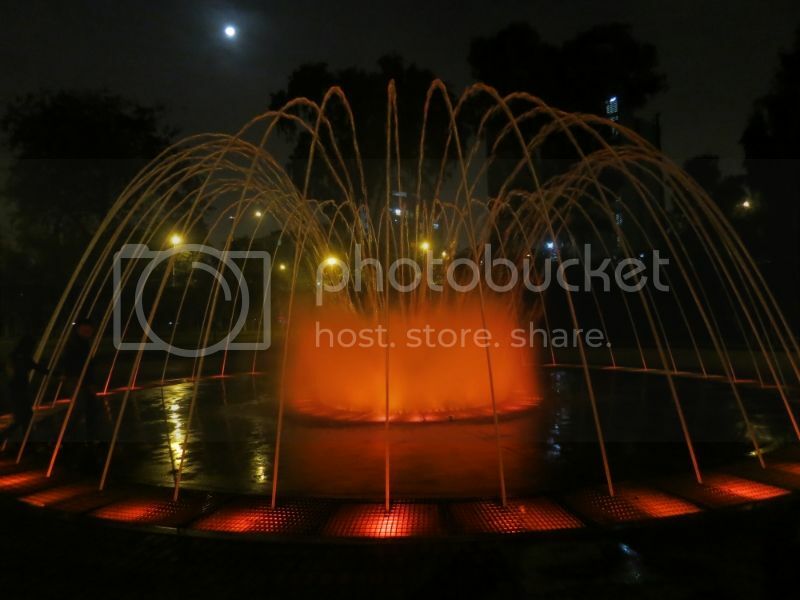 The park has 13 fountains that are each lit up in a different way at night. Many of them are interactive and they even project videos of people performing local dances onto the largest fountain (choreographed with music). It's a wonderful way to spend an evening and was one of the highlights of my visit to Lima. 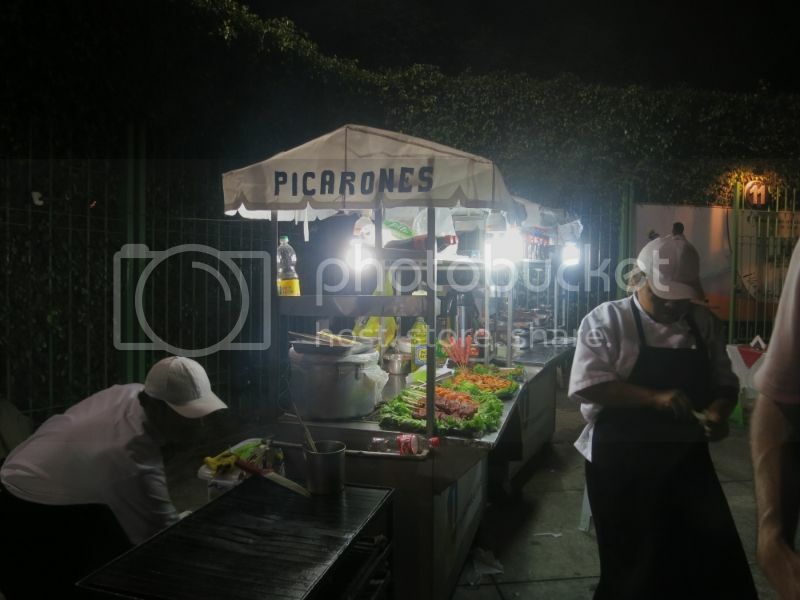 To top it off, street vendors set up shop in front of the park to serve a variety of Peruvian street foods as people leave the park. 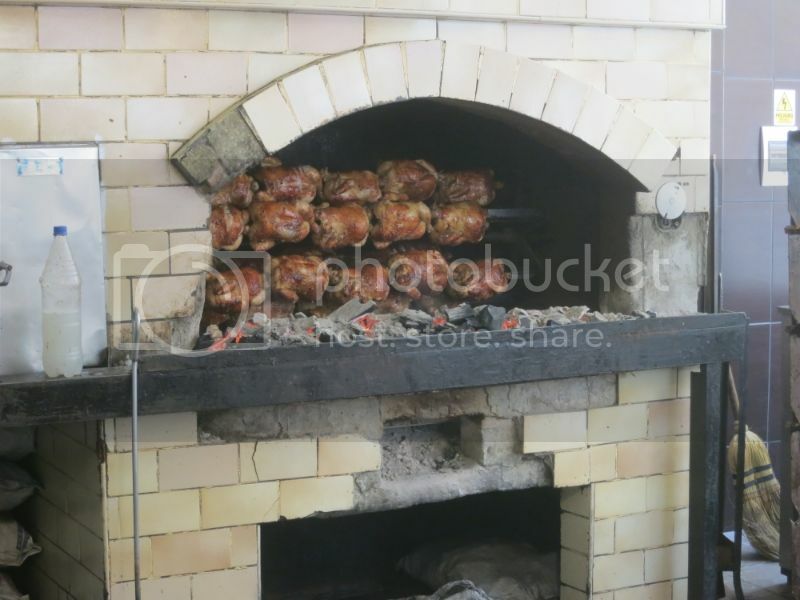 They have charcoal grills set up and a variety of interesting meats ready for grilling. 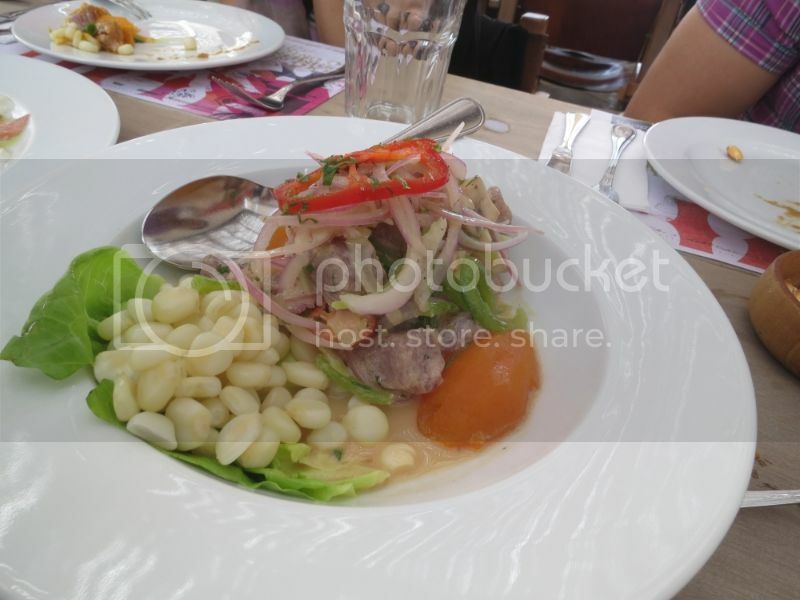 Peruvians love offal and this was evident since nearly all the options were organ meat of some type. The most popular skewer were the anticuchos which were available in nearly every restaurant we visited. Anticuchos are made from beef hearts marinated in aji, garlic, and cumin (amongst other flavors I'm sure). They can range from quite chewy to melt in your mouth tender. I noticed that the chewier they were, the more flavorful they tended to be. The version from the vendor next to the Parque de la Reserva was quite chewy but packed an intense beefy flavor with an assertive but not unpleasant organ meat funkiness. They also have spicy aji sauce on the table which pretty much tastes good with any kind of meat. 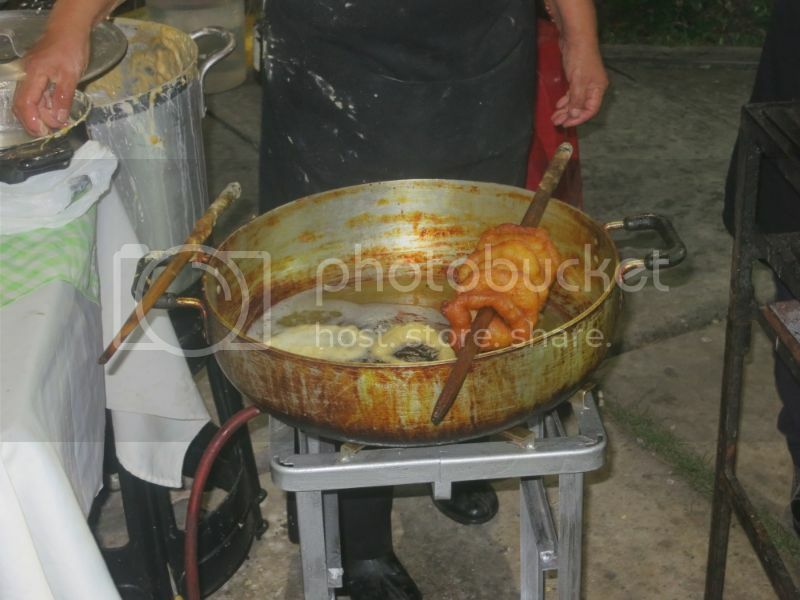 Stands that serve anticuchos frequently also fry up doughnuts called picarones. 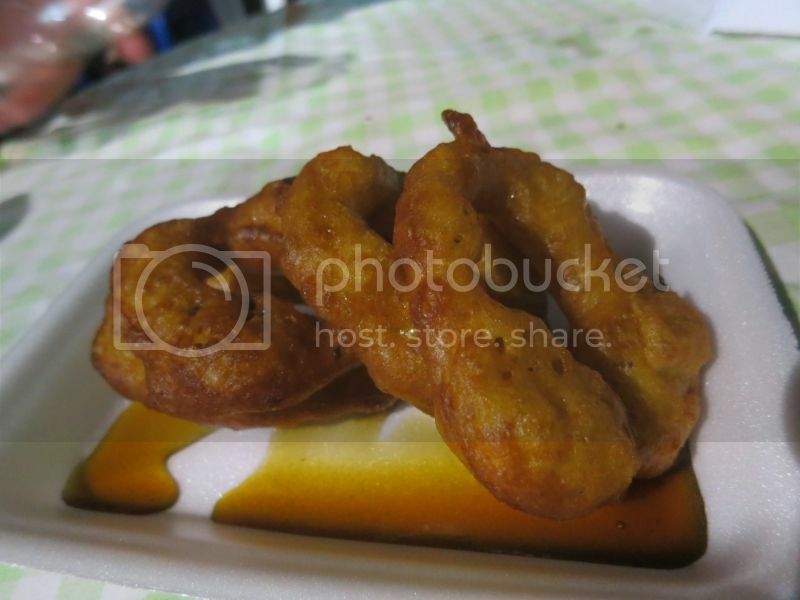 According to wikipedia, Picarones are made from squash and sweet potatoes and covered in a syrup made from molasses. They were quite crispy coming straight out of the fryer and provided a satisfying counter punch to the chewy, gamey anticuchos. Walking around Miraflores there was almost no street food to be found. We did happen across a tiny storefront selling tamales, though. 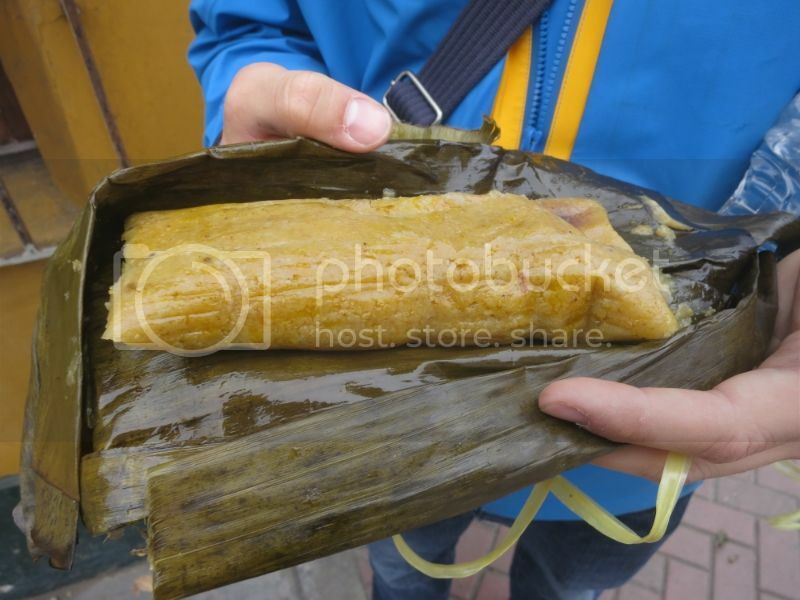 The tamale was stuffed with hard boiled eggs, olives, and shredded chicken in a spicy aji sauce. The masa was more savory and corny than the Mexican varieties I'm more accustomed to. The woman who runs the shop thought we were hilarious because she doesn't usually serve tourists and we were snapping so many pictures. 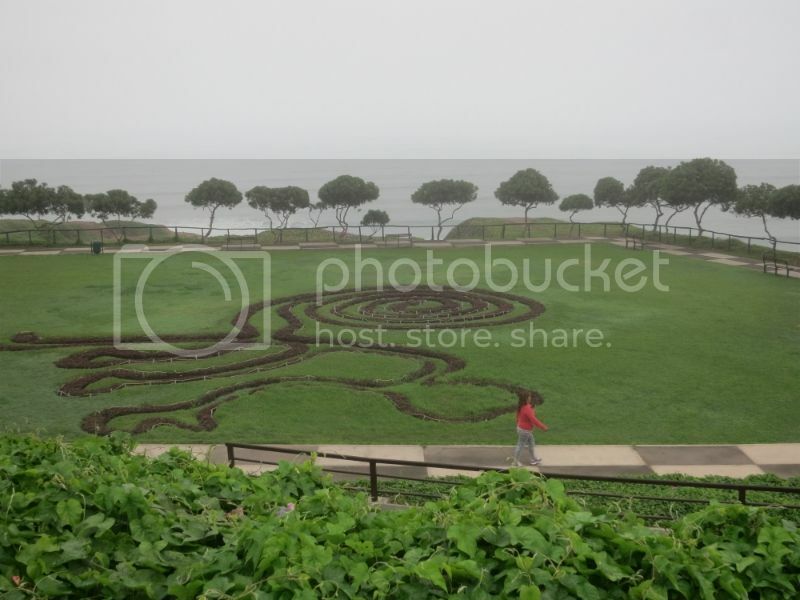 It's a real gem right in the middle of Miraflores and definitely worth a stop. It's located on Berlin Street somewhere between Napanga and Chavez. There was some street food next to the Surquillo Market as well. It's only a short walk from Miraflores, but as soon as you cross the highway the vibe becomes decidedly working class. 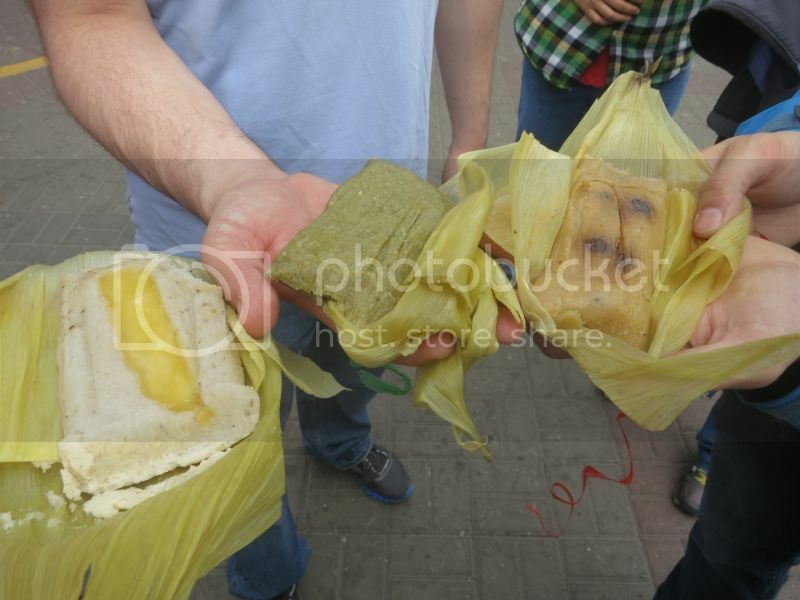 There was a stand selling a variety of tamales so we picked up three at random. We ended up with a cheese tamale, a chicken aji tamale, and a green tamale that had garlic and chiles mashed into the masa. 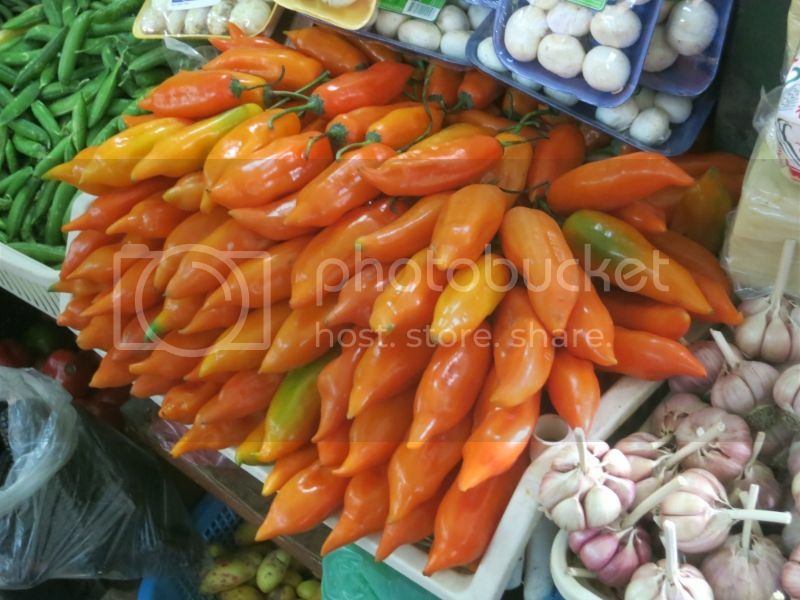 The Surquillo Market has a wider range of produce than the better known Mercado Central which seems to specialize in fish and meat. 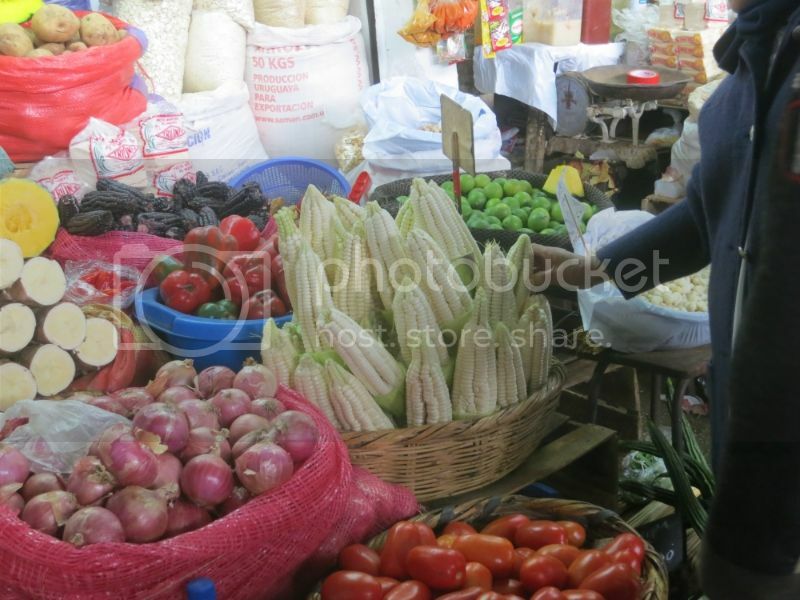 Neither market was particularly impressive when compared to other Latin American markets, but they're worth visiting if you're interested in seeing the variety of local tropical fruits and countless types of potatoes. 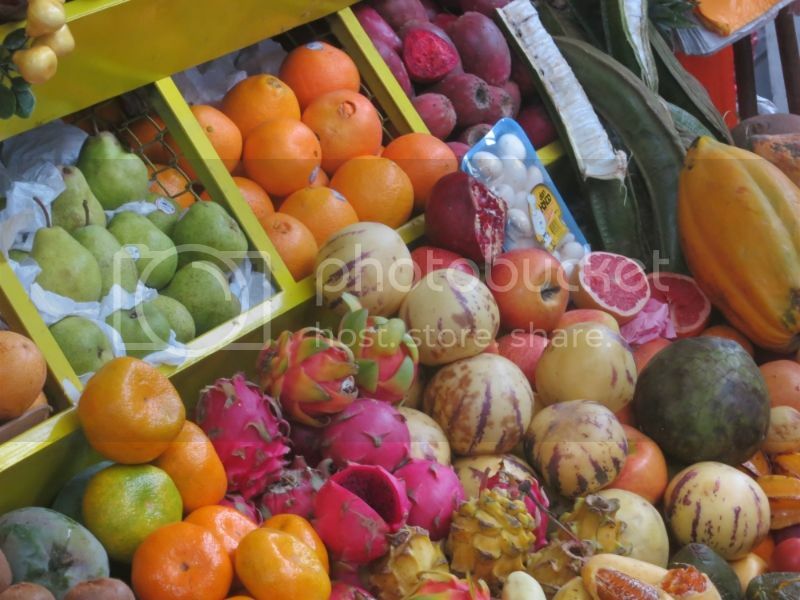 I never did figure out what all the interesting fruits are, though I did get to taste a couple. Many of them were quite sour and are typically used in syrups and drinks with lots of sugar added. 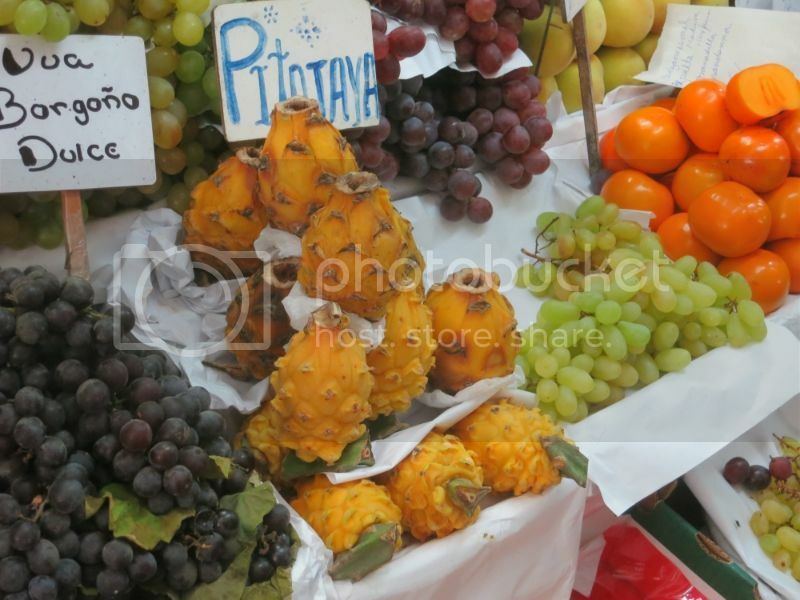 It doesn't take long to walk around the market, but the variety of unique fruits is quite impressive. I also made it a point to snap a picture of the aji amarillos that feature so prominently in the cuisine. They have a uniquely fruity and bright flavor that works really well in ceviches. Also it's frequently dried and added as an ingredient in meat and chicken marinades as well as the very popular Peruvian dish aji de gallina. We also visited the Mercado Central which was smaller than I expected and had far fewer produce stands than the Mercado Surquillo. 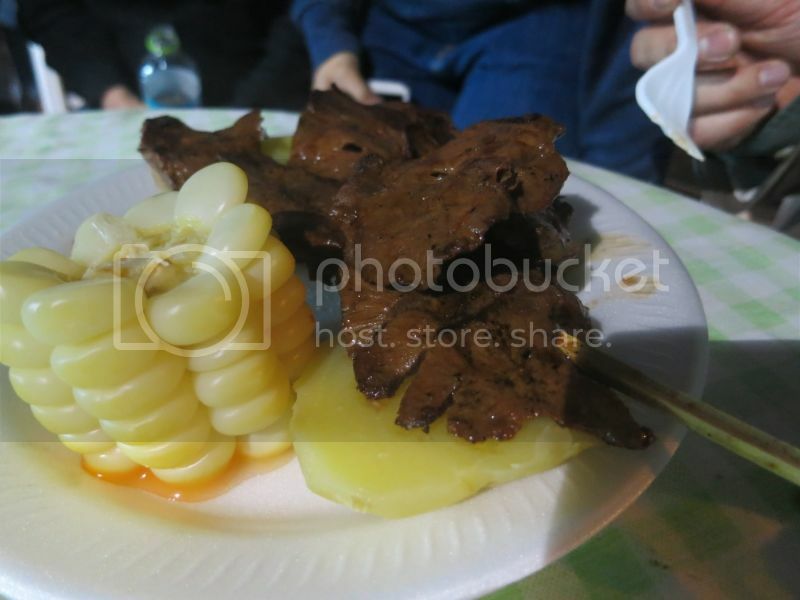 The picture shows the large kernel Peruvian corn that shows up in a lot of ceviches. 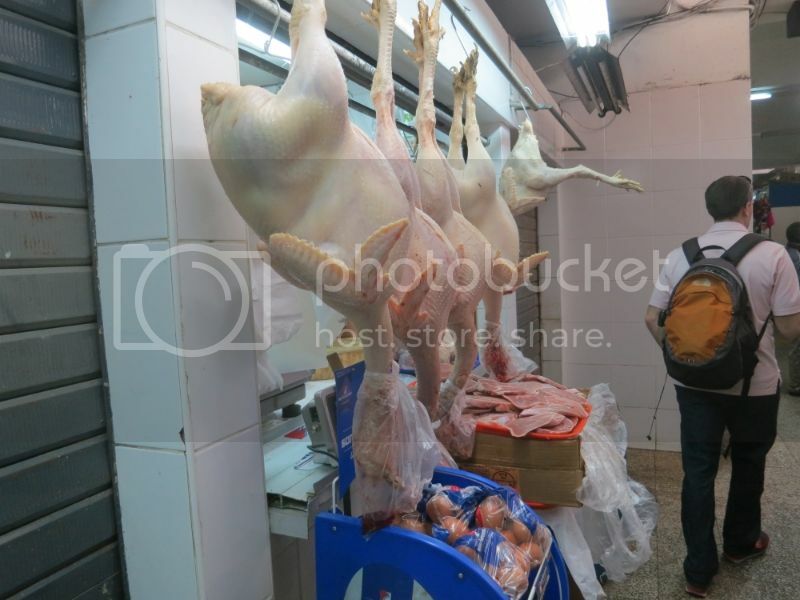 Peru is a meat loving culture and the market reflects that with aisles and aisles of shops selling meat and poultry. Next up is the upscale lunches I enjoyed as Pescados Capitales and Chez Wong. Street food isn't big in Chile either (aside from one motes in huesillo vendor I remember), nor did it seem to me, from what I saw, to be big in Argentina, Brazil, Bolivia, or Colombia (well, that last one might be the least surprising). I wonder how far south of Mexico into Central America the street food tradition extends. It doesn't seem to me to be much of a thing in the southern cone. 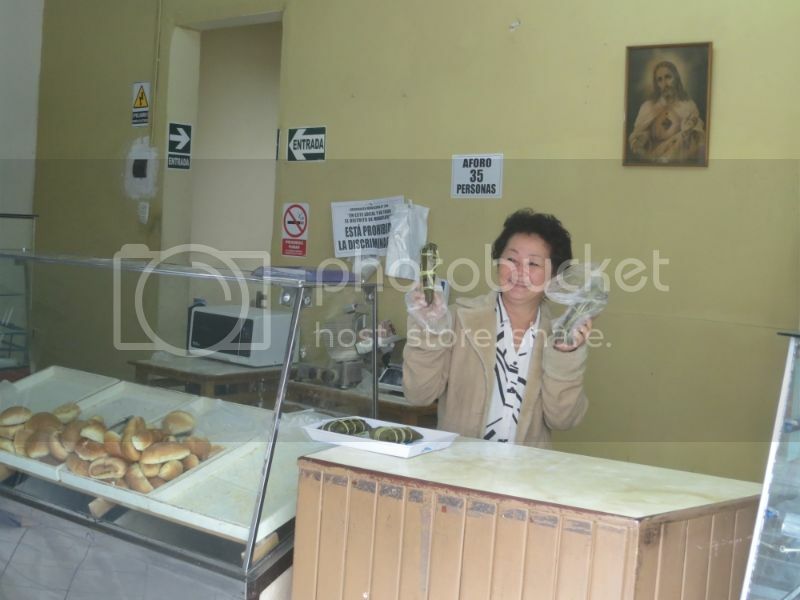 I saw a fair amount of street food in La Paz, usually concentrated in a few places in the city. I remember eating tons of anticuchos, salchipapas, hamburgesas, and saltenas on the street. Actually, La Paz is an excellent food city in general. 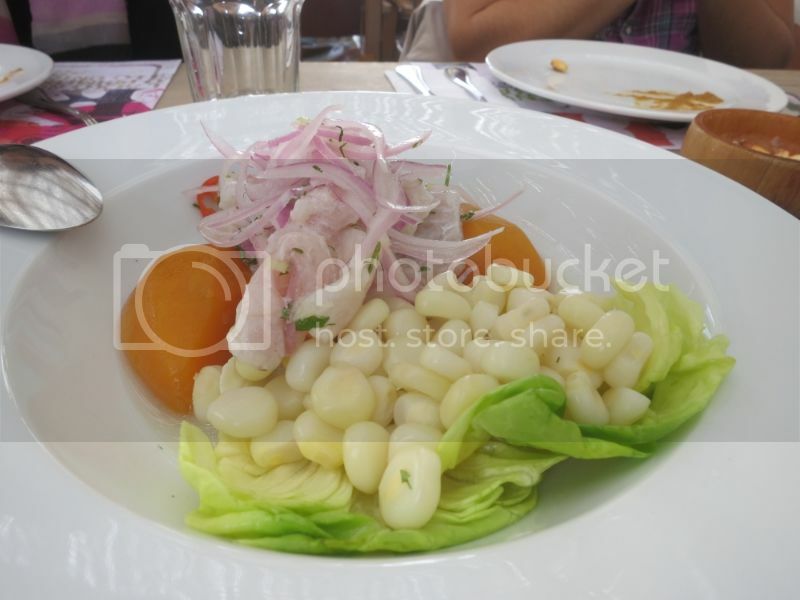 Lima is of course most famous for its cevicherias. I was a little surprised to learn that cevicherias tend to be somewhat upscale, though I suppose it makes sense since the quality of the fish is so important. I did a little research seeking more humble ceviche shops, but really everything I read recommended the same 5 or 6 shops in Miraflores and San Isidro so that's where I ended up. Ceviche is traditionally a lunch food made with that day's catch. 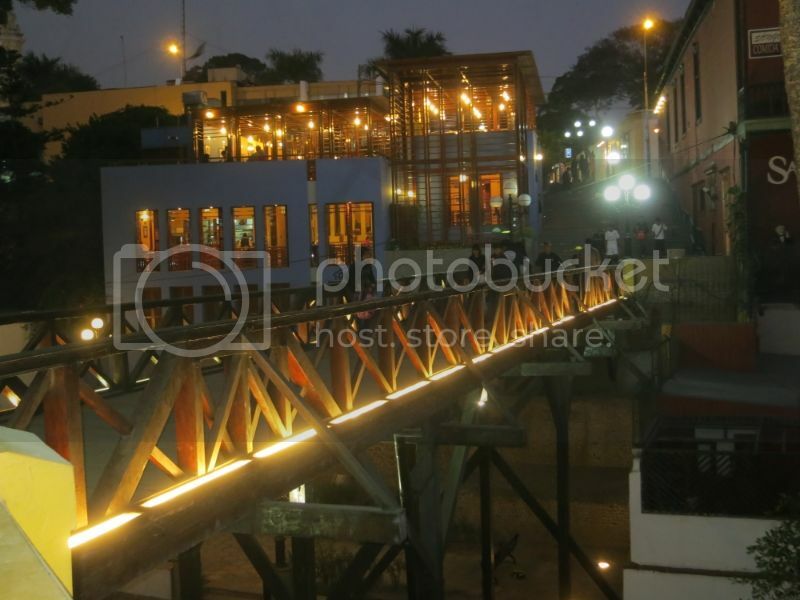 The best known cevicherias are located on Avenida del Mar in Miraflores and most of them close by 4 or 5 o'clock in the afternoon. We visited on a Saturday afternoon and I was expecting to see groups of people hanging out, possibly even hopping between the different restaurants. As it turns out, Avenida del Mar extends for about a mile and the cevicherias are quite spread out. Also, the restaurants are large and none of them were full at any point that I saw. That's not to say there weren't lots of people eating at the restaurants, but the atmosphere was decidedly laid back and chill with locals casually nibbling on ceviche and sipping pisco sours. Most of the seating is outdoors with trees providing shade, which is perfect considering the fantastic weather Lima enjoys almost year round. The two most frequently recommended cevicherias are Pescados Capitales and La Mar. La Mar is owned by Peru's most famous chef, Gaston Acurio, but since we were visiting his flagship restaurant that night (Astrid y Gaston) we opted for Pescados Capitales. 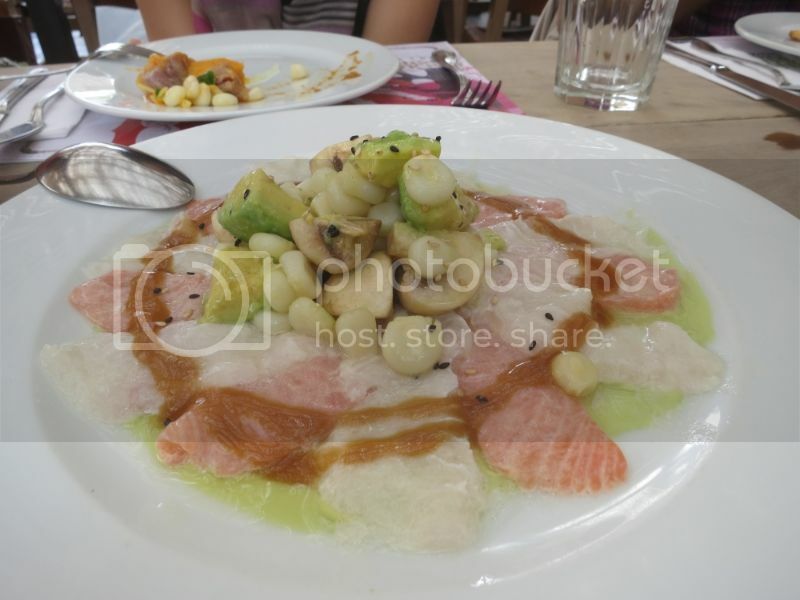 Overall I found the quality of ceviche in Lima to be fairly consistent from restaurant to restaurant. Fresh fish is somewhat easy to come by and the best ceviches are subtle and really let the fresh fish do the talking. I was also a little surprised to learn that in Peru they add the acid to the fish right before bringing it out to the table. The notion that the acid cooks the fish is anathema to Peruvian ceviche. I wasn't served any ceviche where the fish was "cooked" by the acidic sauce in any meaningful way. So I guess what made the often recommended Pescados Capitales stick out was the variety of fish and sauces that they offered. 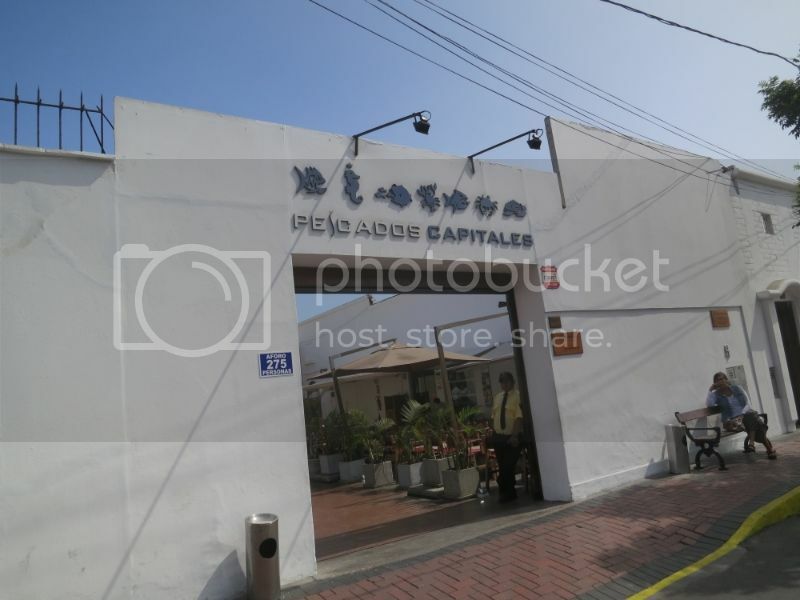 Pescados Capitales is a play on words with the Spanish phrase "pecados capitales" which means capital sins. The entire menu plays on this theme. The chastity (castidad) is their classic ceviche using the fish of the day which in this case was corvina. The classic ceviche uses lime juice, garlic, cilantro, and red onion to amplify the subtle taste of the fish. 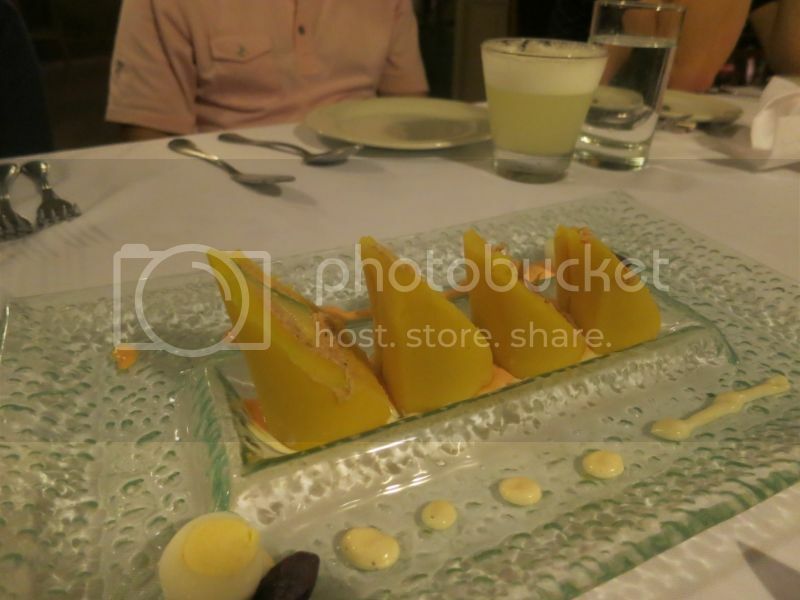 It's a perfect marriage and this preparation was on nearly every menu I encountered in Lima. This is their take on the classic tiradito which again uses the fish of the day. This preparation was also on nearly every menu. 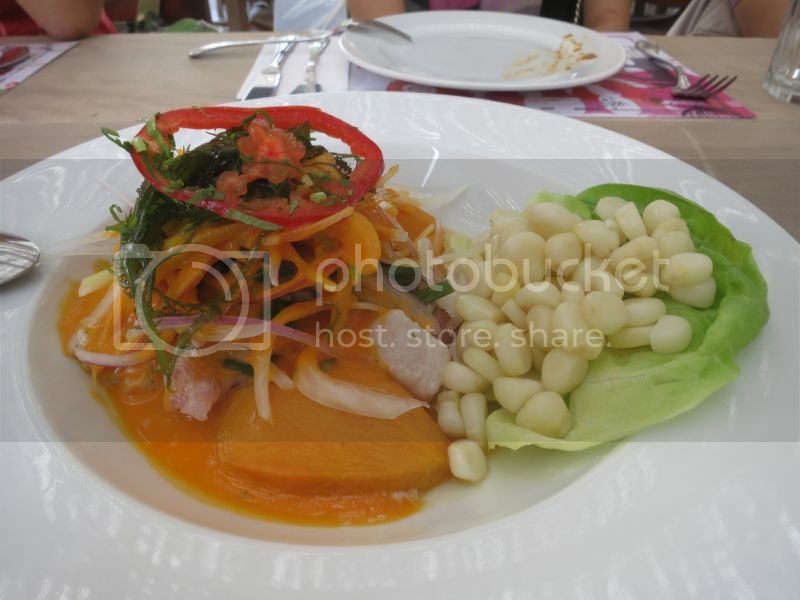 It differs from the classic ceviche in that the fish is sliced like sashimi (an influence from Japanese immigrants) and the sauce features aji paste that turns it orange. The diligence (diligence) is their tribute to Nelson Mandela, presumably because of the dark fleshed fish. 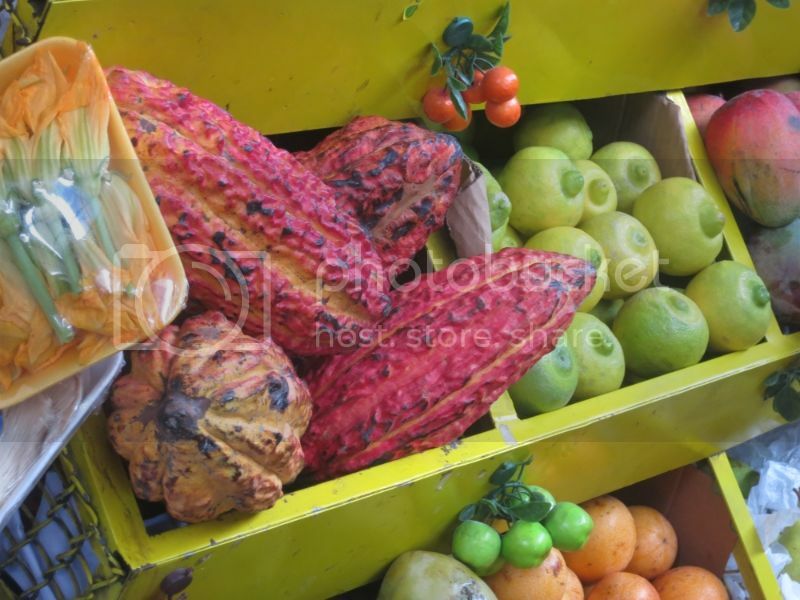 It is a sweeter preparation that claims influences from Caribbean and African cuisine. The tuna itself is cut into cubes and ends up kind of chewy. It was the only time I saw tuna on a ceviche menu. The charity (caridad) is a tiradito that features salmon and flounder in an Asian-influenced sauce. In Peru they use the term Chifa to refer to their brand of fusion between Asian and Peruvian flavors. It's quite common around town and made for some interesting bites. 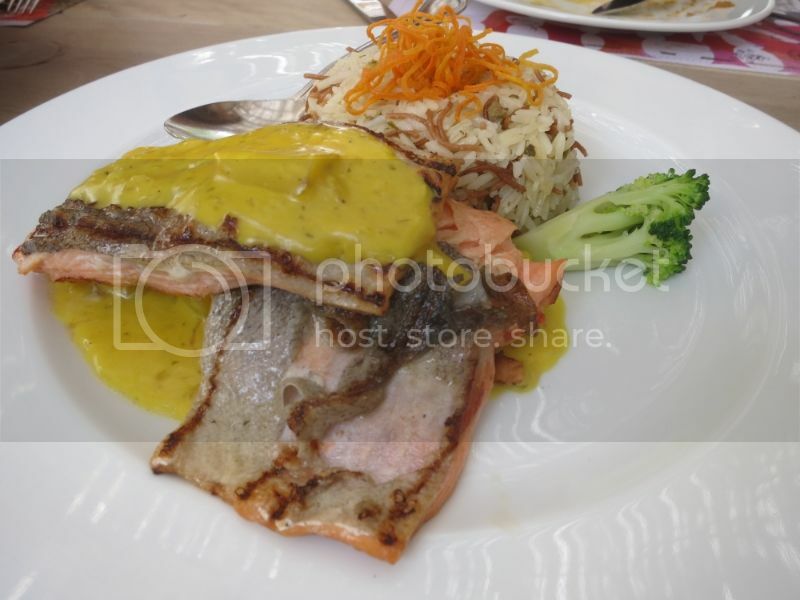 The vanity (vanidad) is a simple grilled salmon topped with a lemon-butter sauce. The skin was nice and crispy and the flesh was flavorful. I think the raw dishes are more distinctive than the cooked dishes, but this one in particular showed that the kitchen knows how to cook fish too. The passiveness (pasividad) is a seafood risotto with some quinoa mixed in. They call it quinuotto on the menu but really the quinoa was more of an accent that brought some textural contrast and nuttiness to the dish. The risotto has a deep seafood (and garlic!) flavor and the texture on the shellfish was spot on. The Santa Ira is their grilled octopus dish. 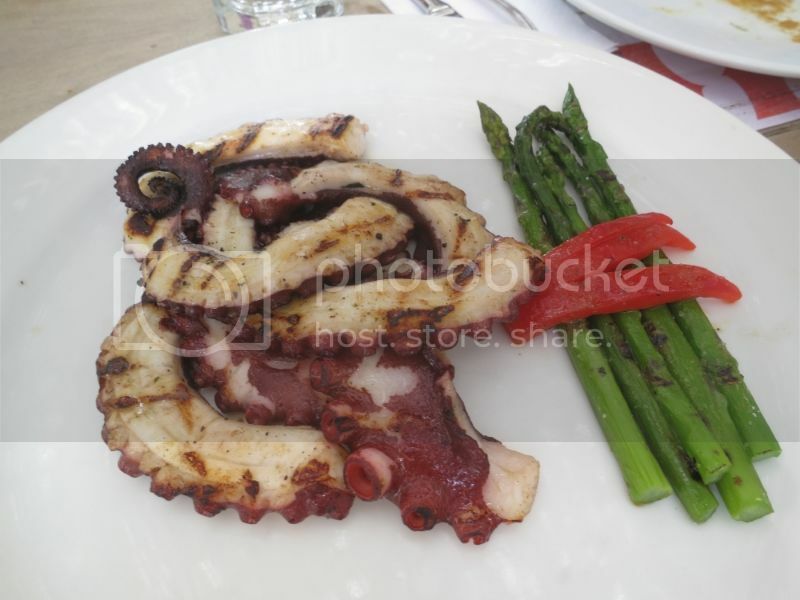 Grilled octopus is very common on Limeno menus and this rendition was the best we had. 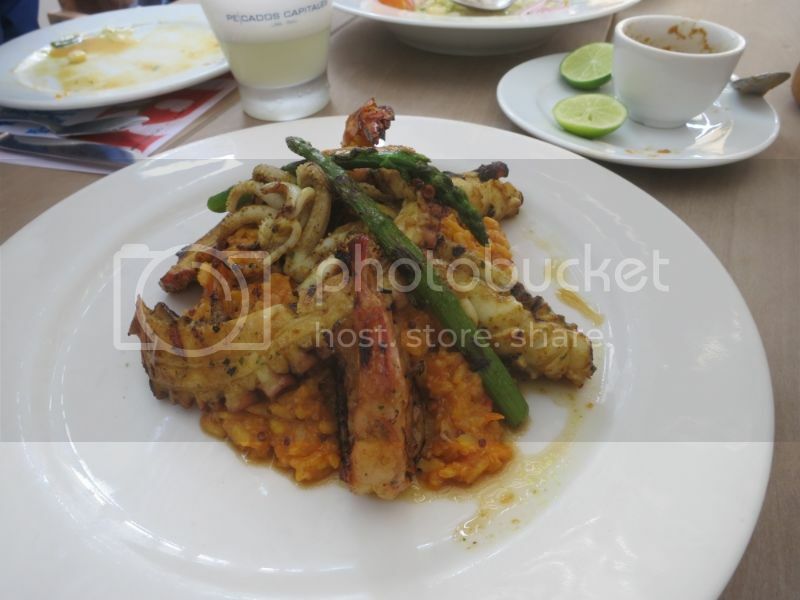 The preparation is fairly straight forward that featured tender octopus with a nice grilled flavor. 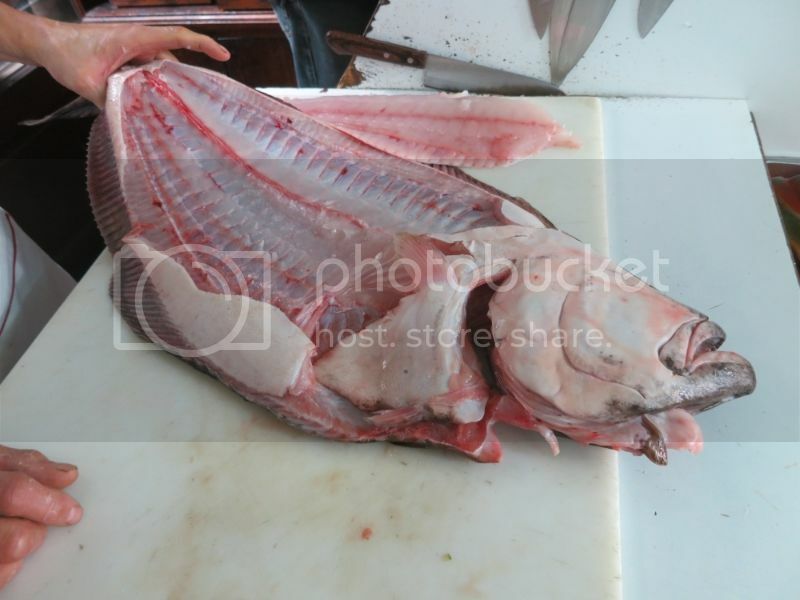 Pescados Capitales offers a wide range of different raw and cooked seafood preparations and does them very well. The experience of sitting in their shaded outdoor dining area, sipping on a pisco sour, and munching on citrus-kissed raw fish is as Lima as it gets. Really cool stuff. I have thought of the acid as "cooking" the fish, but the way seems to be that the acid is largely seasoning. Pasividad is probably like apathy, or Sloth, one of the distinguished members of the Seven. Whereas so many of the experiences I had at Lima restaurants were fundamentally similar including most of the same dishes being offered, Chez Wong stood out as a completely unique experience. It typically shows up on the list of best cevicherias, but it really is so much more than that. 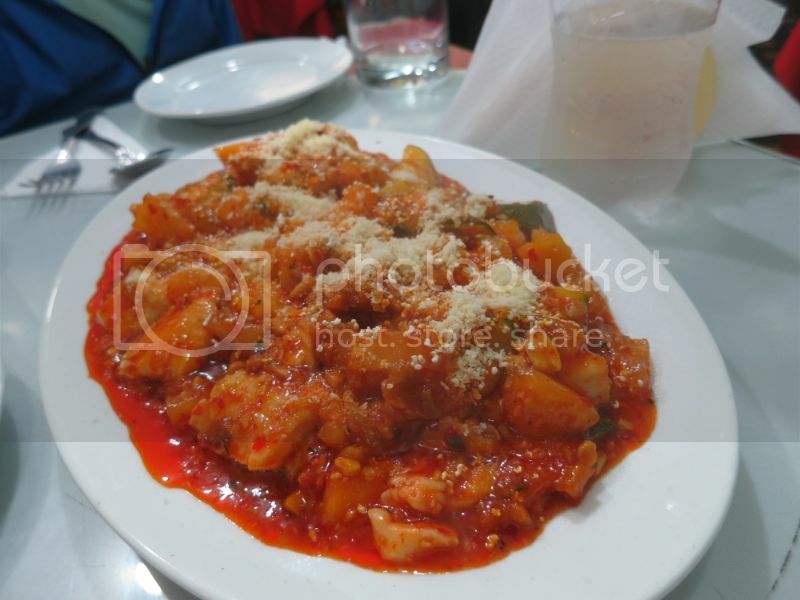 I considered going to a Chifa restaurant but couldn't find one that I was convinced would offer more than typical Americanized Chinese fare (and so many Chifa dishes were available on other menus so I was able to try it anyway). Chez Wong may be something of an elevated experience, but it really opened my eyes to how good Chifa can be in the hands of a capable chef. Chez Wong has a reputation for being hard to get into, but all you have to do is email the chef a couple weeks in advance. The restaurant is open from 12 to 3 on weekdays and there aren't many seats so I guess supply and demand can make it a hard seat to land. It's located in a nondescript residential neighborhood with no other restaurants. The only way you know it's there is if you have the address. There is a door man who checks for your reservation and unlocks the door to let you in. The inside has probably 20 seats and it was filled with local businessmen. Javier Wong is something of a local food celebrity and many people were taking pictures with him throughout the meal. He has a bunch of pictures up on the wall of famous people who have visited his restaurant. All of the dishes feature impeccable flounder and he frequently holds the fish up for pictures. 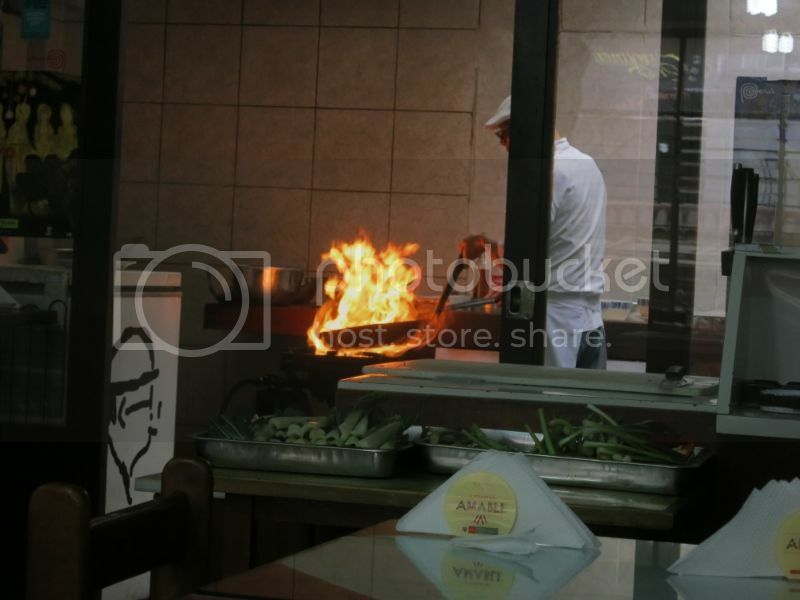 The kitchen is clearly visible from the dining room and can make for some exciting moments when he fires up the wok. There is no menu and you basically get to choose either two or three dishes that he's making that day. The meal began with an octopus and flounder ceviche that featured the classic lime juice, cilantro, garlic, and red onion dressing. The chewy octopus and fluffy flounder made for wonderful textural contrasts. My dining companions and I agreed this was the best ceviche we had on the trip. It was executed flawlessly. Next up was a flounder stir fry with mushrooms, chinese broccoli, black beans, and aji amarillo. This was a spectacular fusion dish matching the crunchiness of the broccoli with the supple flounder and hearty mushrooms. The brightness of the aji really popped and the broccoli had wonderful wok hei that leant depth to the dish. The sweet and sour flounder was perfectly balanced. The sauce was mostly sour and was accented with aji paste. The sweetness came from the cantaloupe and zucchini that made the dish quite unique. The fusion was subtle but enough to make this different from any other Chinese meal I've had. Chef Wong's attention to textures and flavors really underscored how exciting Chifa cuisine can be in the right hands. The entire experience is intimate and you can interact directly with the chef. He's an expert at his craft and his popularity in such a unique environment is a testament to how well regarded he is locally. 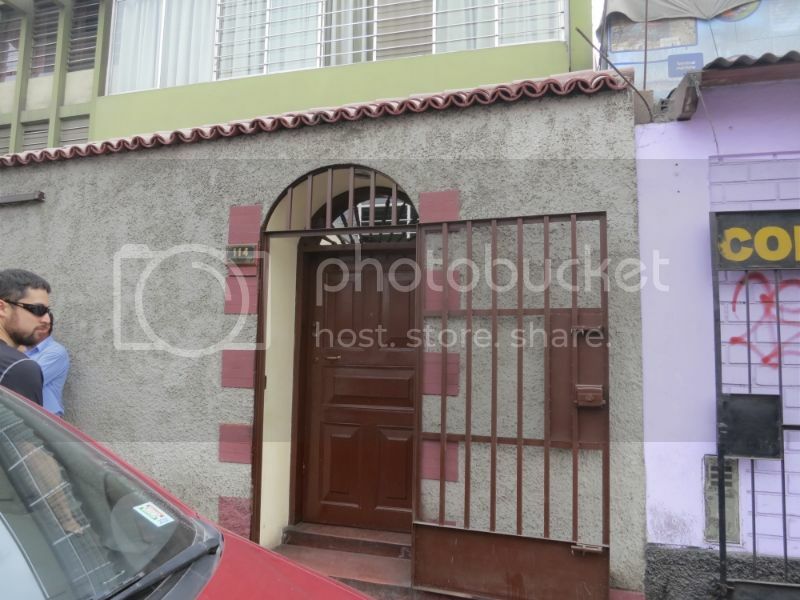 The Barranco neighborhood is a short cab ride from Miraflores. Its most famous land mark is the Bridge of Sighs around which there are a number of bars and restaurants that look over the sea. The neighborhood is built on a cliff and at night the area where people descend to the beach is filled with young Limeno couples enjoying the sea breeze. It's a fun area with a bustling night life and definitely worth visiting at night. If you cross Lima's equivalent of Lakeshore drive, there are a handful of bars that look over the water. Some of them looked like kitschy night clubs, but we did happen across the elegant and hip Cala as we were walking down the waterfront. It's got a nice outdoor terrace area and a balcony that literally puts you on top of the ocean. The waves lap up against the side of the restaurant fill the air with a light and refreshing mist. It's a pretty remarkable setting. That's a picture of me sipping on a glass of pisco brandy. Best of all, they served me the best pisco sour I had on the trip. 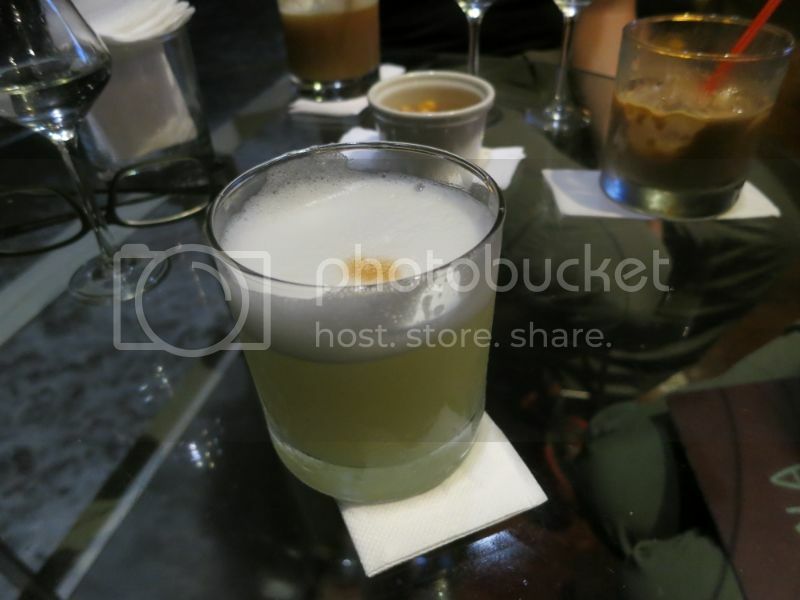 The pisco sour is the national drink of Peru and it's available all over town. It's made with pisco brandy which is made from local grapes. Most bottles of pisco emphasize the type of grape they use rather than the brand. A pisco sour blends pisco brandy with simple syrup, lime juice, and whipped egg whites and it's topped with angostura bitters. The result is quite dry (unlike most pisco sours I've had in the US) and refreshing. It's easy to drink 3 or 4 those while watching the waves crash against the shore. The pisco sour at Cala had a thick and creamy texture from the well whipped egg whites and used fresh lime juice. 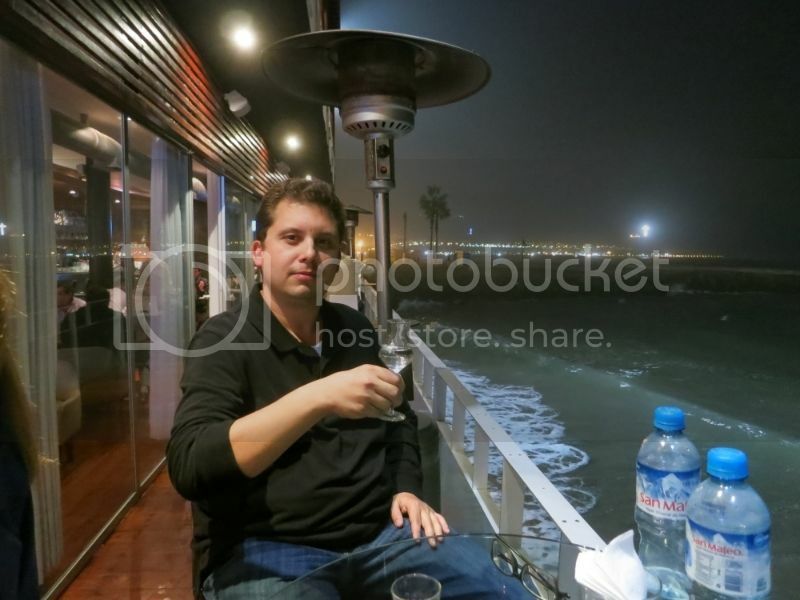 Getting a drink or two on Lima's waterfront was a wonderful way to pass the evening. The Pisco Sours is what I best remember about Lima, Peru. And now it's time for dinner. As it turned out I ended up in Lima for two Sunday dinners which can be challenging. Most of Lima's best known restaurants are closed on Sundays and those that are open clearly cater to tourists. I might have tried my luck walking around looking for something interesting but I was with a fairly large group so we settled on Alfresco and La Rosa Nautica. To my surprise both were actually quite good. The menus were virtually identical and didn't offer much in the way of creativity or variety, but I was quite pleased at the quality considering the circumstances. La Rosa Nautica is right on the water so you can hear the waves crash against the shore while you eat (so naturally it was a little more expensive) whereas Alfresco is located on a quiet road a couple blocks in from the Malecon. Since both restaurants offered essentially the same list of Peruvian classics, I'll describe the meals together. Both meals began with fairly straightforward ceviche preparations. Ceviche is usually served with fried corn kernels that come with aji sauce for dipping. 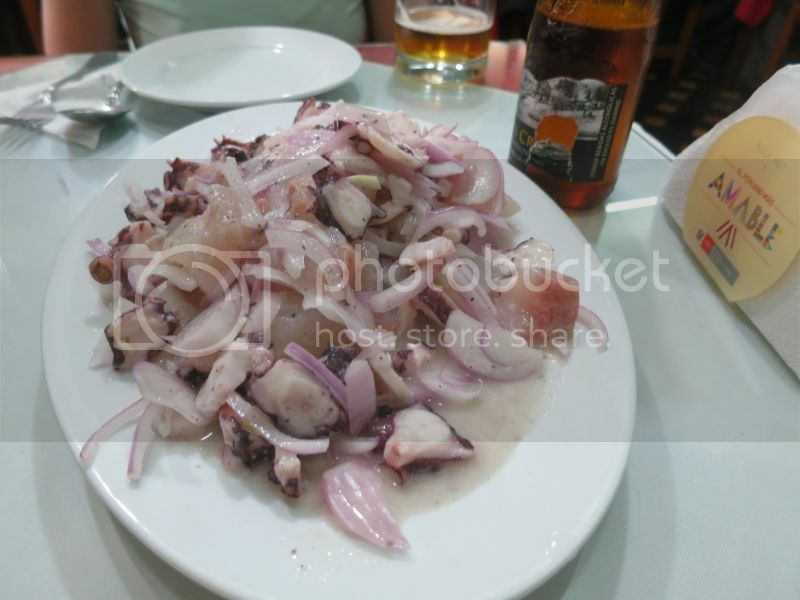 This picture shows them next to a classic octopus ceviche, but usually they're served in a cup separate from the fish. There are three classic ceviche flavors. The white one is a simple garlic, onion, lime juice ceviche, the orange one adds aji amarillo paste and the green one has cilantro and parsley (I'm pretty sure it's not just cilantro though I'm not 100% sure). 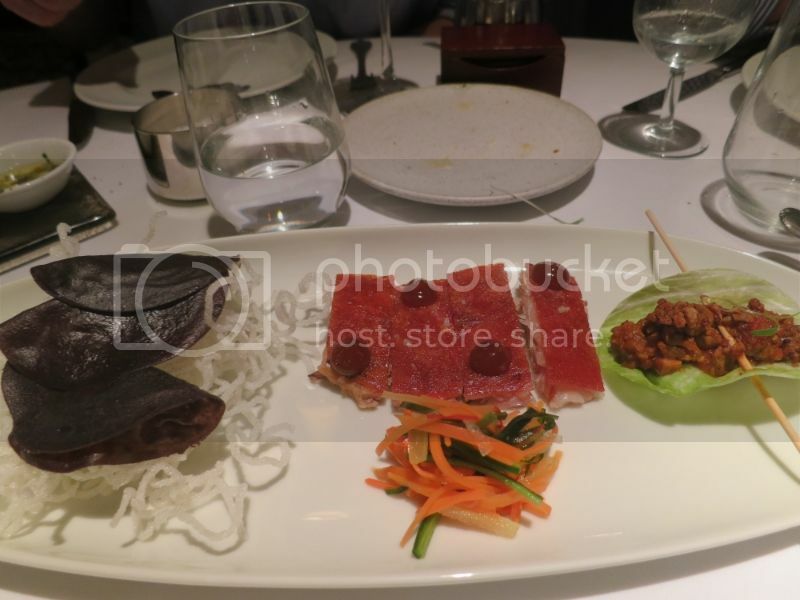 It was common to see the fish of the day offered on a plate with the three flavors. The fourth one (at the end) on this plate had passionfruit juice in it as well but I didn't enjoy that as much as the classic flavors. The classic ceviche and the tiradito are virtually identical, with the only difference, as far as I could tell, being the way the fish is cut. 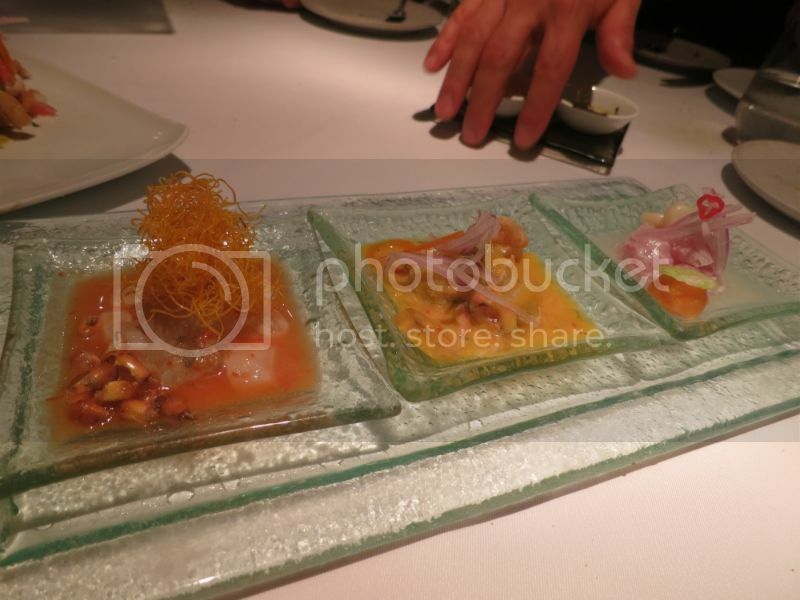 The tiradito slices the fish thin like sashimi whereas the classic cuts the fish into small cubes. I preferred the tiradito cut because the bites of fish are more tender, but I can see why someone would prefer the chewier texture of the classic ceviche. 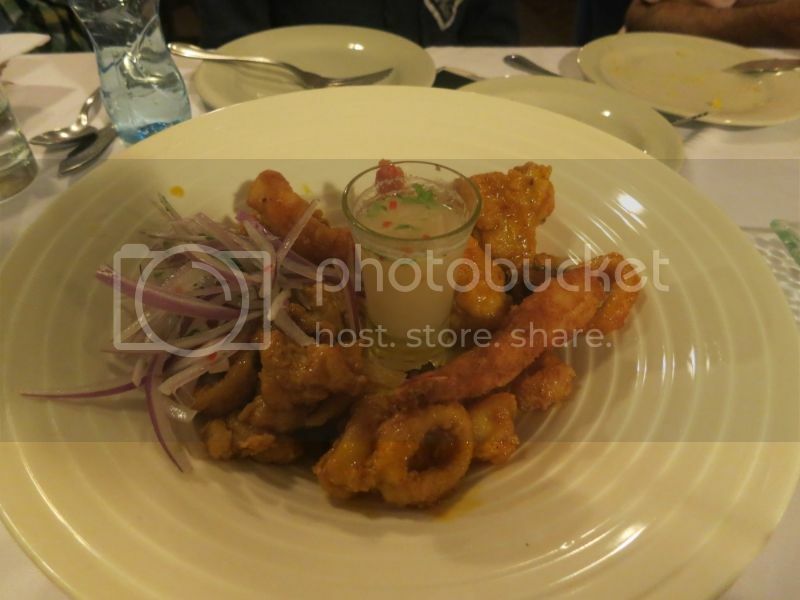 Jalea is Peruvian fried seafood. The breading is generally quite light and crispy and it's frequently served with leche de tigre which is the juice leftover from making ceviche. 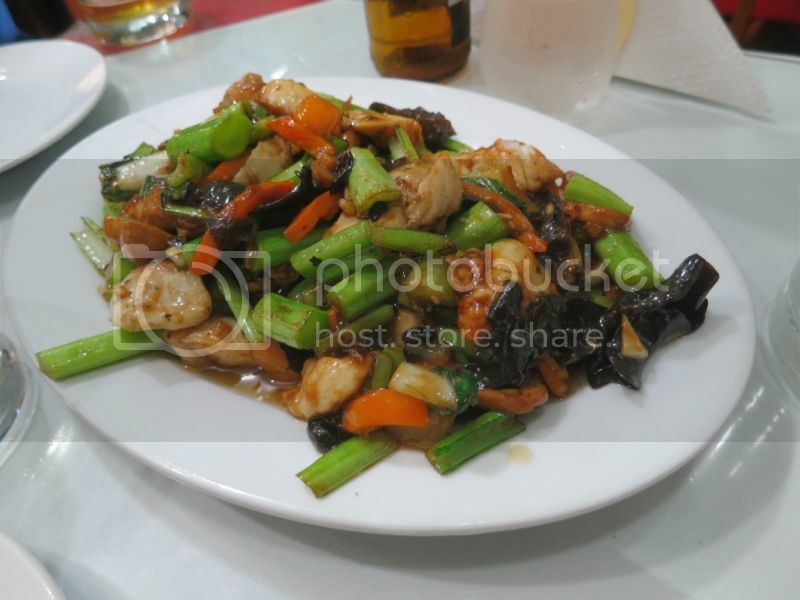 The acidic Leche de tigre is a superb sauce for fried seafood. 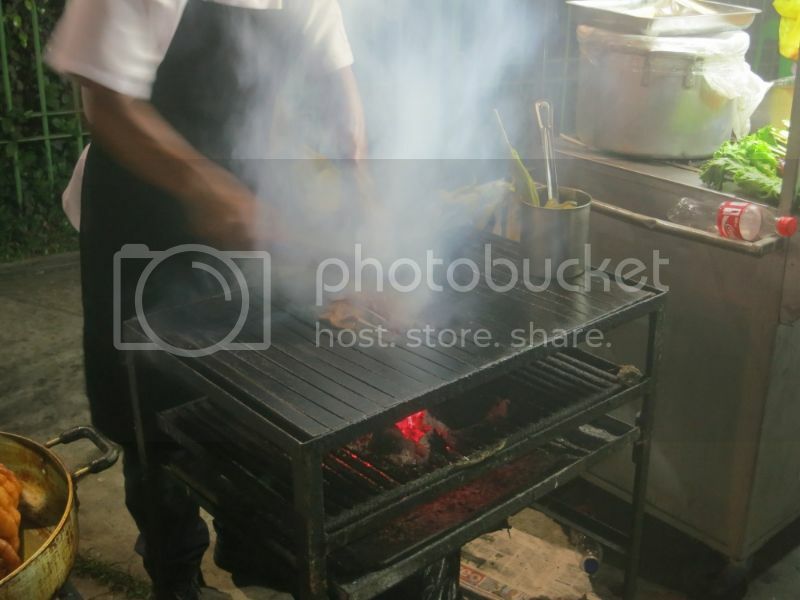 They also grill a lot of seafood over charcoal and serve it with aji sauce. Aji really does taste good with just about everything and grilled seafood is no exception. Causas are another classic Peruvian dish. They are essentially stuffed mashed potatoes. Menus would typically feature 4-5 different causas stuffed with meat, chicken, or seafood. These causas were stuffed with a mayo-based shrimp salad. Next to all the bright seafood preparations I wasn't crazy about the mouthfuls of mashed potatoes, but I could see enjoying the meatier versions of this dish in a colder climate (like the Andes where I imagine this comes from). Overall I felt Alfresco and La Rosa Nautica provided a nice cross section of coastal Peruvian cuisine. 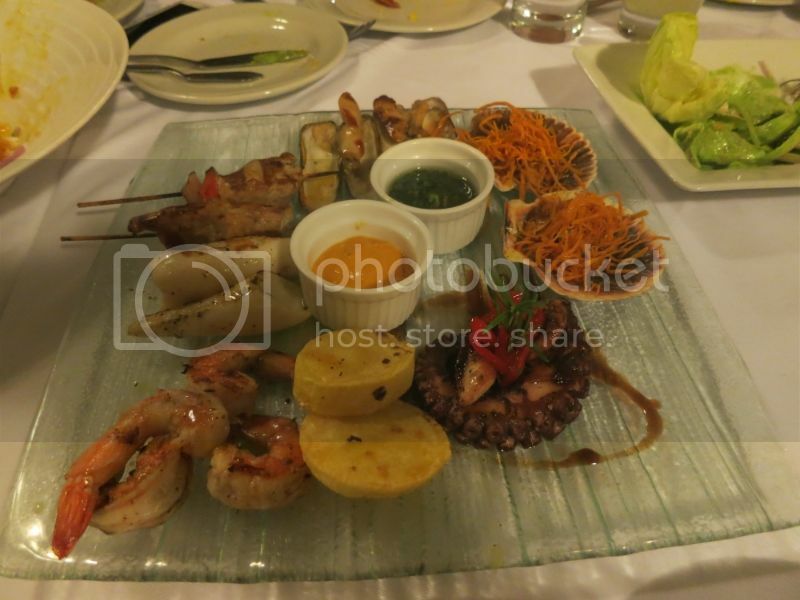 They highlighted fresh seafood prepared simply and lots of pisco sours to keep the evening interesting. And finally, I saved Peru's most famous restaurant for last. Astrid y Gaston is the flagship restaurant of Gaston Acurio's empire. 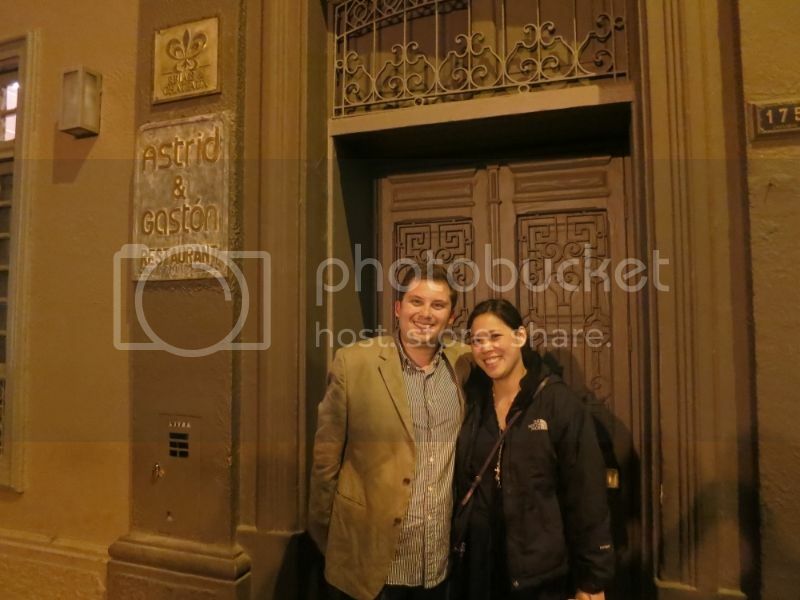 Gaston is a local food celebrity who is famous for elevating Peru's traditional cuisine and influencing an entire generation of chefs that have been bringing a lot of attention to Peruvian cuisine internationally. He opened Astrid y Gaston in 1994 which defined Peruvian haute cuisine and has since opened a cevicheria (La Mar), an anticucheria (Panchita), and a sangucheria (Pasquale Hnos, with which he is no longer affiliated). I only made it to Astrid y Gaston, but his take on Peruvian classics is hugely popular and I would love to check out more of his restaurants on a future trip. I have to admit to being a little disappointed by Astrid y Gaston. It was recently named the 14th best restaurant in the world, and I know most people don't put much stock into that sort of thing, but the comparisons to many of the most ambitious and creative restaurants in the world took some of the luster off of the experience for me. I got a sense that on some level Gaston is a victim of his own success. His vision and techniques have become commonplace across the city so the food really didn't stand out as much as I would have expected. Certainly this was an excellent meal and I would gladly recommend it to anyone, but I have to think there are newer restaurants pushing the envelope a little more and executing more exciting takes on the cuisine. On many levels this was an outstanding experience. The pisco list was quite impressive and since I was with a big group we got to sample a wide range of piscos. 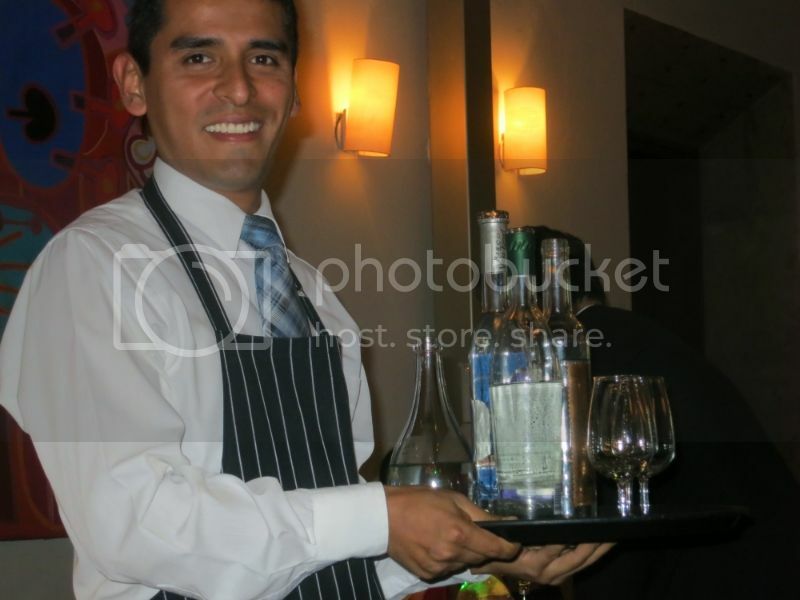 Pisco ranges from fruity and rich to bone dry and medicinal and everything in between. The pisco lists in Peru aren't generally very long, so if you do make it to Astrid y Gaston, definitely take advantage of the variety. The service was excellent across the board and the environment is casual which makes for a relaxed experience. My group requested to have the dishes served in waves so we could share everything and the service was spot on delivering two dishes every 15 minutes or so. They offer a tasting menu, but I felt like we were able to try a wider range of items (for less money at that) by ordering a variety of dishes for the table. I really appreciated the restaurant's flexibility in this way and I think my group enjoyed the experience far more because of it. 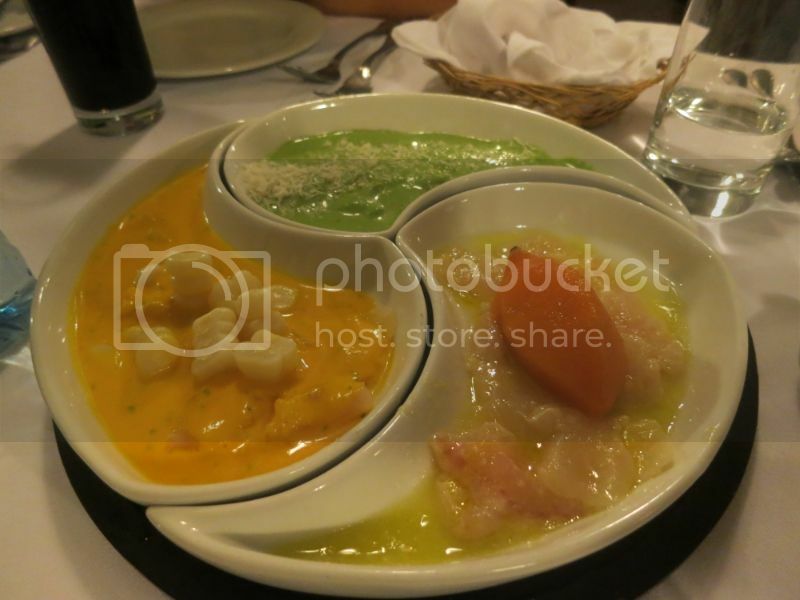 As with most meals in Lima, we started off with a couple different ceviches. The servings were small and really didn't stick out from what we'd had around town. If you're seeking a premium ceviche experience, the cevicherias, which are dedicated to ceviche and are only open for lunch, delivered much more innovative takes on Peru's national dish. I think this was the biggest issue for me. Everything was great, but so much of it wasn't appreciably different than what we'd had around town. For those new to Peruvian cuisine the ceviches would dazzle, but for those with a little more experience, I was hoping for something more exciting. The smoked octopus, while delicious, didn't really pop for me. It's served with a black olive foam that was mild and really just an artistic flare more than anything else. Very good octopus but I preferred the charcoal grilled octopuses that deliver more intense smoke and seafood flavors. 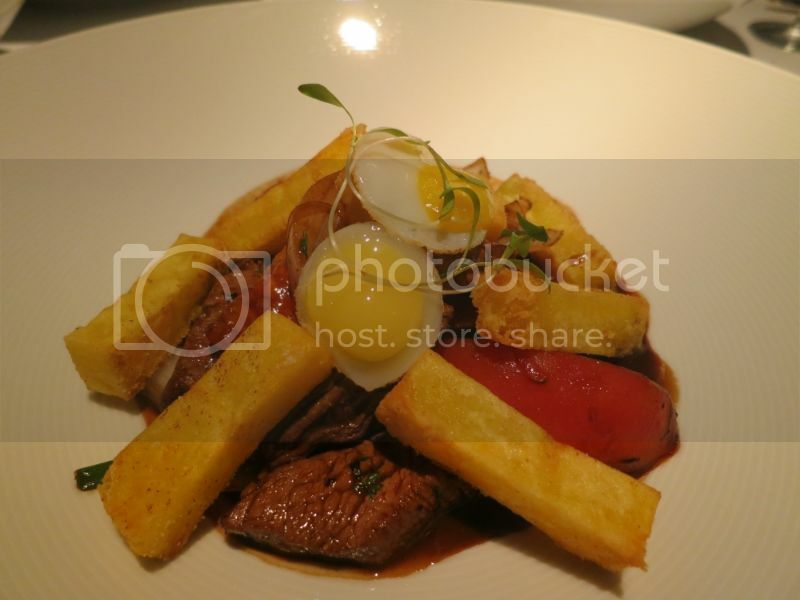 The lomo saltado was my favorite dish in the meal. Lomo saltado is a Peruvian classic that was more common in Cusco than in Lima. It's a sirloin that is stewed in soy sauce and tomatoes and served with fried potatoes. This beef had an intensely beefy flavor and the potatoes were beautifully crispy on the outside and soft on the inside. This really stood out as a wonderful preparation of a humble dish. And finally, their signature dish, the peking guinea pig. When I read about the peking guinea pig, I was kind of hoping they would carve it at the table. This was probably too much to ask. Guinea pig (which they call cuy) is a common dish in the Andes region and something we didn't encounter very much in Lima. 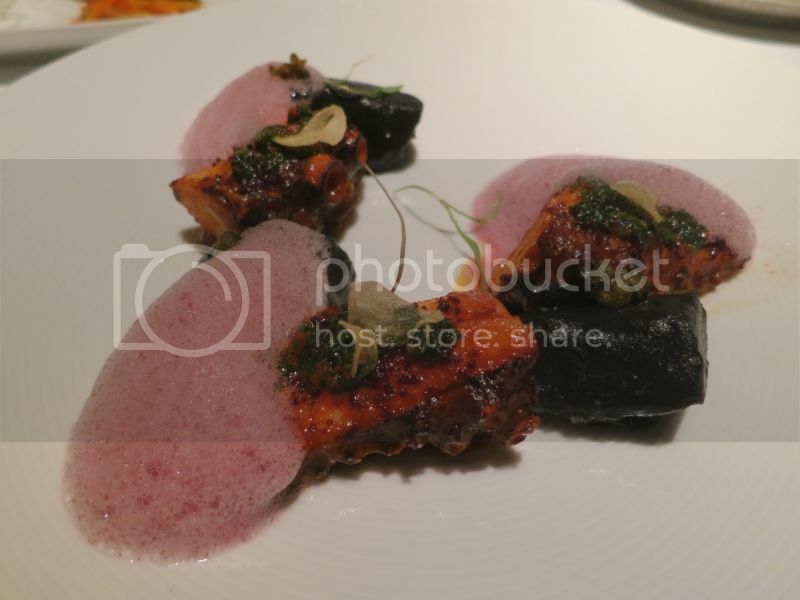 This preparation was a confit guinea pig topped with crispy skin and served with a blue corn tortilla. The dollops of dark sauce are made from chicha morada which is a beverage made from the blue corn. I really enjoyed the bites of guinea pig which were quite rich and the crispy skin was fantastic, but I didn't think the whole was greater than the sum of its parts. The fusion seemed a little forced on this dish. And man it would have been cool if they'd carved a guinea pig at the table. Overall Astrid y Gaston is a very good restaurant whose influence on Lima's culinary reputation is undeniable. There are countless modern Peruvian restaurants around town and the cuisine has started spreading across the continent and beyond. I didn't have any issues with the preparation of the food and everything tasted good, but for me, the expectations I had coming in left me wanting a little more ingenuity. Great reports! Thanks so much for posting. One thing I missed, tho': didn't you get huacutay sauce with anything? Again, tnx for an excellent report. I didn't see huacatay on any menus when I was there. Not sure if it's a seasonal thing or if it just isn't that popular. I am far from an experienced photographer and I am unwilling to carry around a large camera when I'm travelling so I opted for the Canon S100. I use it exclusively on auto mode though I probably should invest a little time in learning how to use its countless features. That said, I've been pretty happy with it. Anyone been to Lima, Cuzco or Aguascalientes in the last 5 years? We'll be going in February. JoelF wrote: Anyone been to Lima, Cuzco or Aguascalientes in the last 5 years? We'll be going in February. Visited all 3 in 2016. Would highly recommend Maido in Lima (and probably Central if we were able to go there too). In Cusco we loved Cicciolina and Senzo (located in the Belmond Palacio Nazarenas where we stayed). 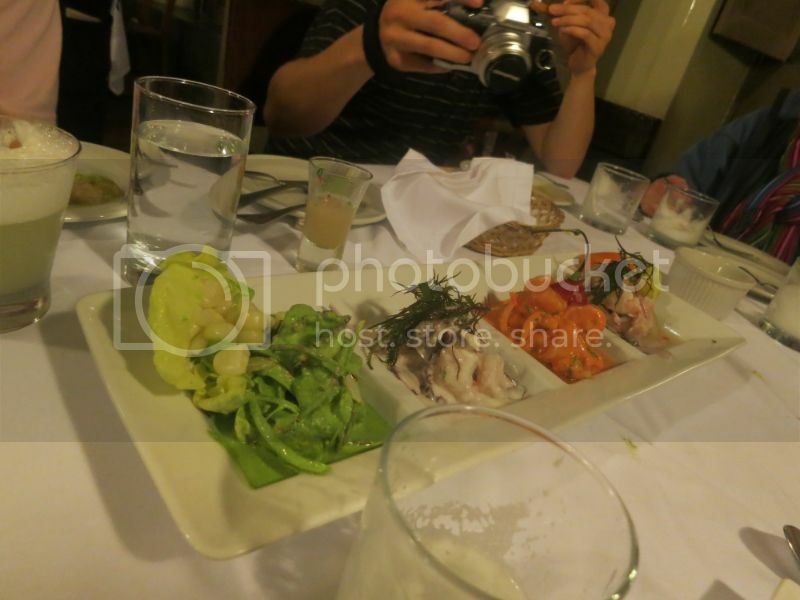 Can't really recommend anything in particular for Aguas Calientes as we ate on the Hiram Bingham train. From nearly nowhere, Lima, Peru has landed in a slot of 'cities I want to get to'. The reason? With the abject failure of the U.S. Men's National Soccer Team to qualify for World Cup 2018; the next opportunity for redemption is the 2020 Tokyo Olympics® (in Japan [doh] - notice how these elements all seem to tie up? ). The Olympic® soccer competition is for under-23-year-olds (with a limited number of overage players permitted on the squad). Before engaging in CONCACAF qualifying for the Olympics®, the squad will play in a bunch of competitive matches. The best opportunity for competitive matches will be the 2019 Pan American Games. Guess where that will be? So, I'll be doing fact (& fare-) finding explorations out here on the World-Wide Web, and that will certainly include this thread. Equally important, I hope to be credentialled and land a media outlet in order to report on the U-23 squad in Lima, Peru. JoelF wrote: Would highly recommend Maido in Lima (and probably Central if we were able to go there too). We've managed to get a reservation between our flights from Cuzco and our flight home (about a 6 hour layover), but I think we'll skip the "Nikkei Experience" menu -- just a bit too much before a long flight. A la carte should be fine.